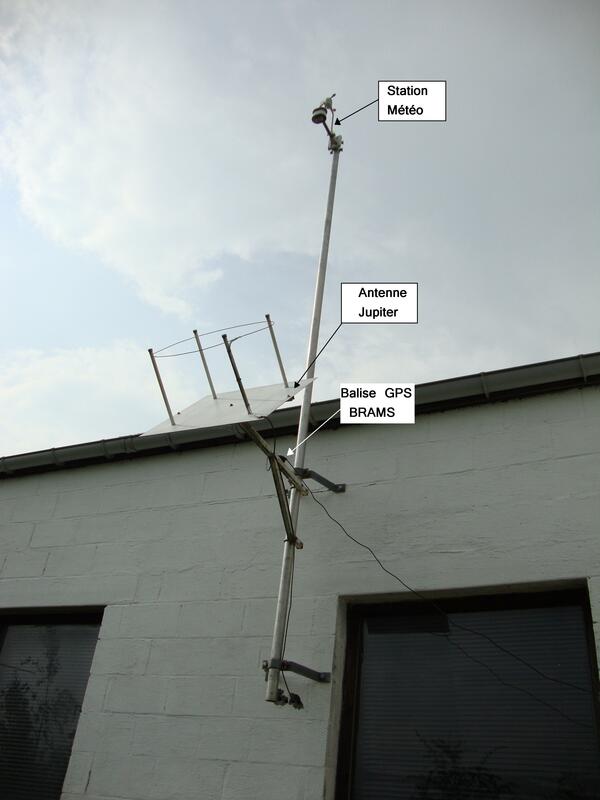 On April 4, Hervé Lamy gave a conference about "Radio detections of meteors with the BRAMS network" at the radioamateur club ON5UB in Woluwé St-Lambert. The presentation can be found here here. 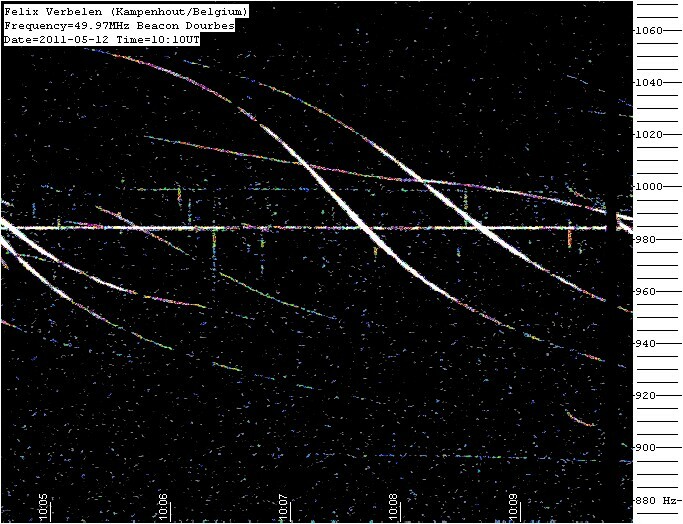 H. Lamy gave a talk about comparisons of data obtained between the CAMS-Benelux optical network and the BRAMS radio network during the annual CAMS meeting organized at the MIRA Observatory in Grimbergen on 10 March 2019. 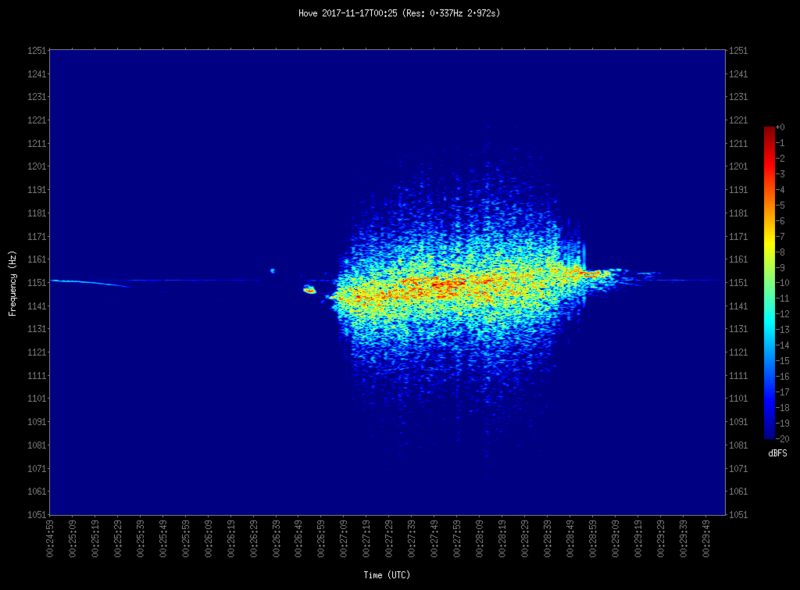 Our next Radio Meteor Zoo objective is to observe activity from a "minor" meteor shower called the Alpha Monocerotids. The parent body at the origin of the shower is not known but is assumed to be a long-period comet. The shower was visually observed in 1925, 1935, 1985 and 1995, each time around November 21. Every time, the period of activity was very short (a few tens of minutes to a few hours). In 1995, it produced a spectacular outburst with around 200 meteors observed in half an hour. 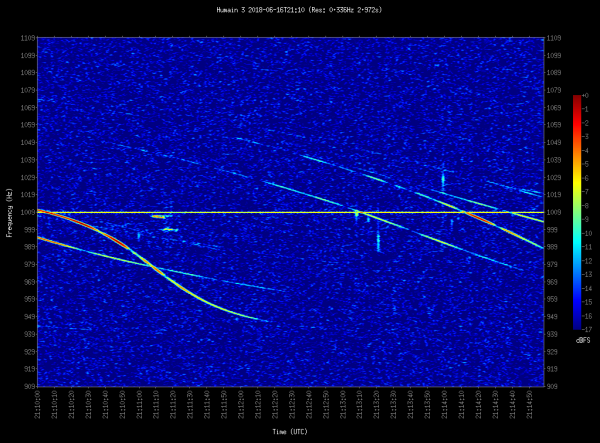 Some models suggest that Earth will cross a dust trail on November 21, around 21h UT and we will investigate this with our radio observations from the BRAMS network. 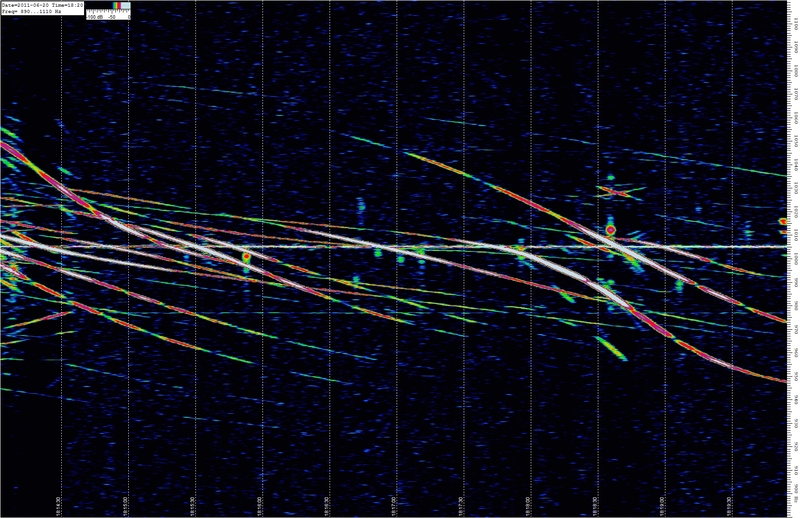 In 1995, forward scatter radio observations clearly detected the Alpha Monocerotids above the sporadic background. So we are confident that, if there is an outburst, we will be able to detect it. 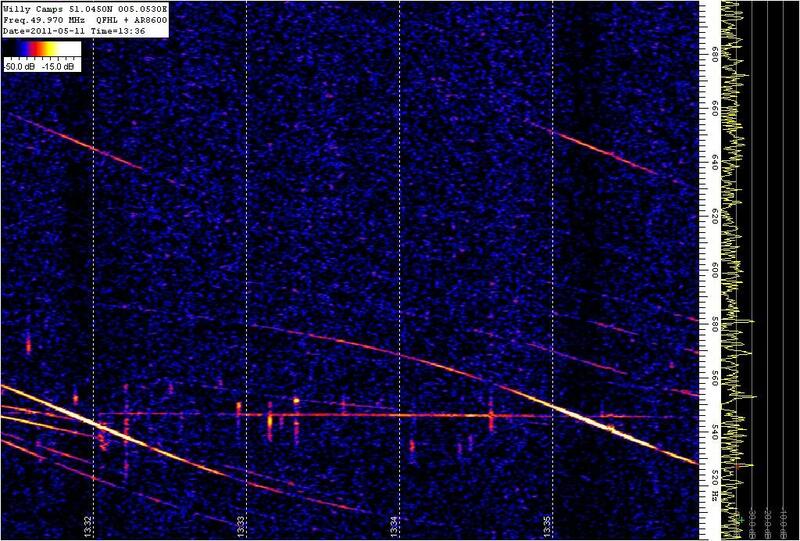 Since the entry speed of these meteors is estimated at 65 km/s, we expect to have a lot of complex meteor echoes, which justifies the use of the Radio Meteor Zoo to detect them. 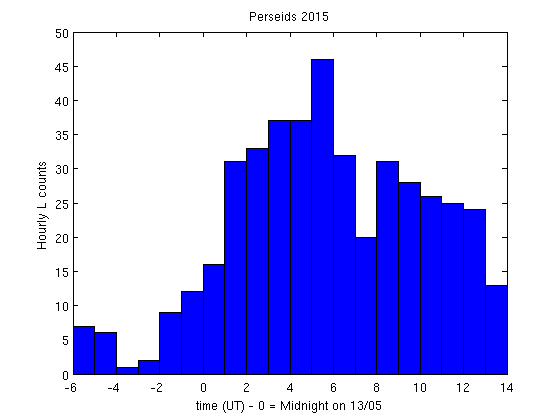 You are cordially invited to help us processing the observations from November 22 9h UT onwards. 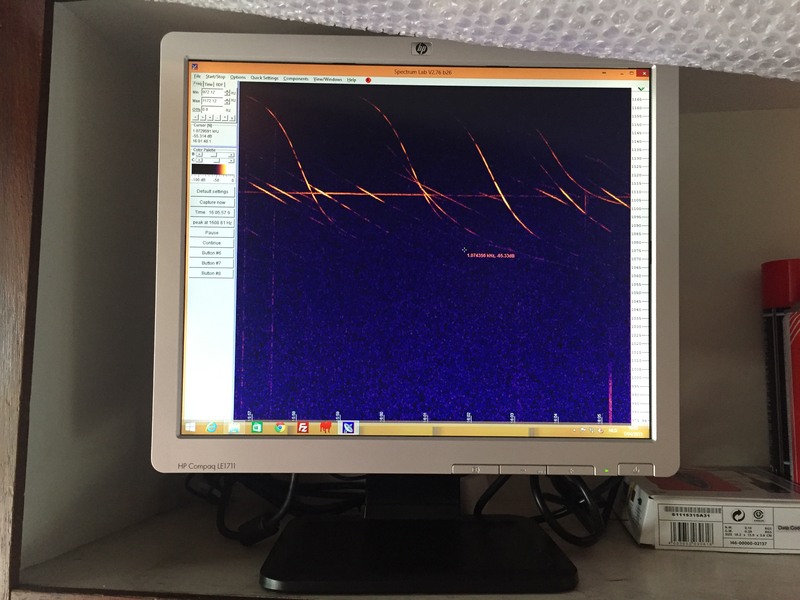 We look forward to seeing as many Radio Meteor Zoo users as possible to help us hunt the Alpha Monocerotids! For more information, please check this link on the Radio Meteor Zoo forum or this link on the IMO website. 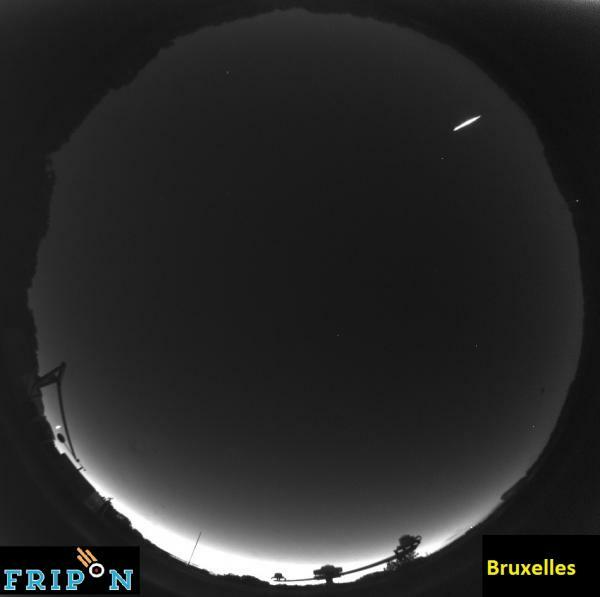 [2017-11-21]Last week-end two bright fireballs were observed above/nearby Belgium and BRAMS clearly detected them. 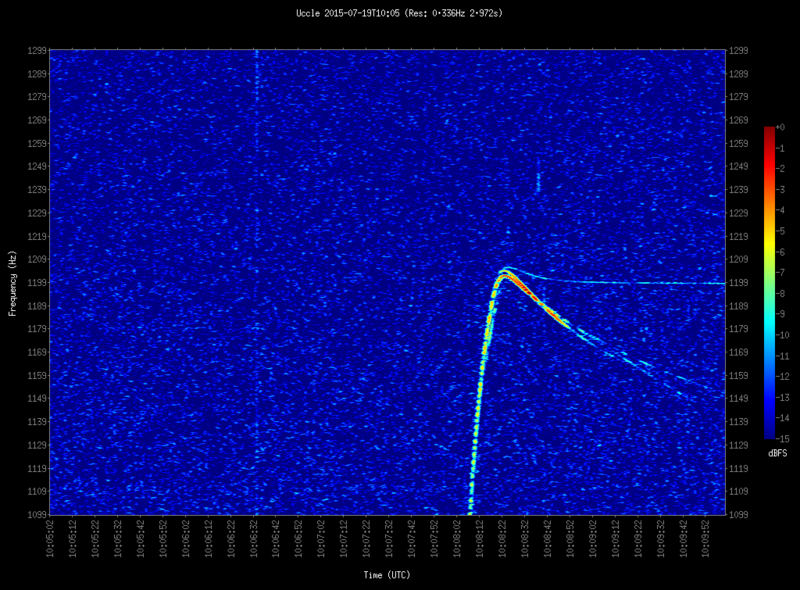 The first one was on 17 November at 00:27 UT. 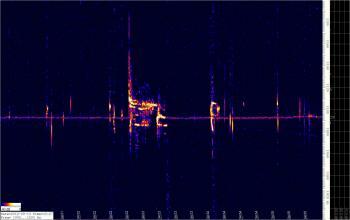 Below are spectrograms from BEHOVE and BELIEG. 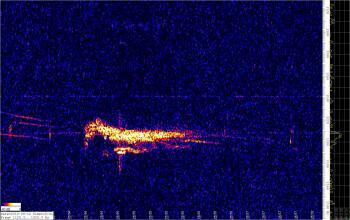 The meteor echo was so bright that it actually smears out most of the other signals in the images. The second one was on 19 November at 02:29 UT. 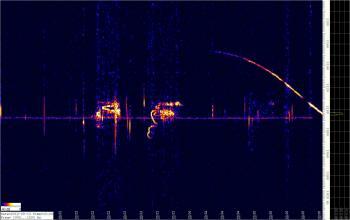 Below are spectrograms from BEHUMA and BEOPHA. 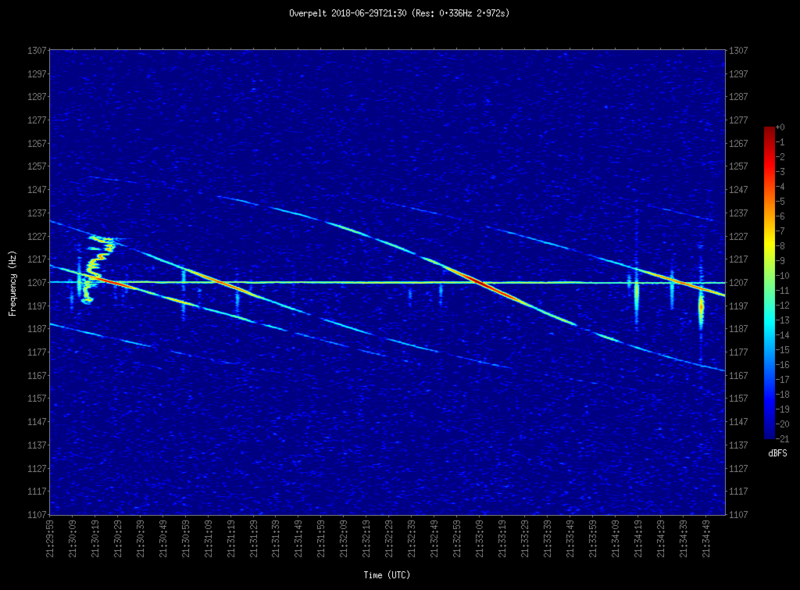 The meteor echo is very long and split on two consecutive spectrograms. It was observed with video cameras above Netherlands. See this link for some spectacular images. 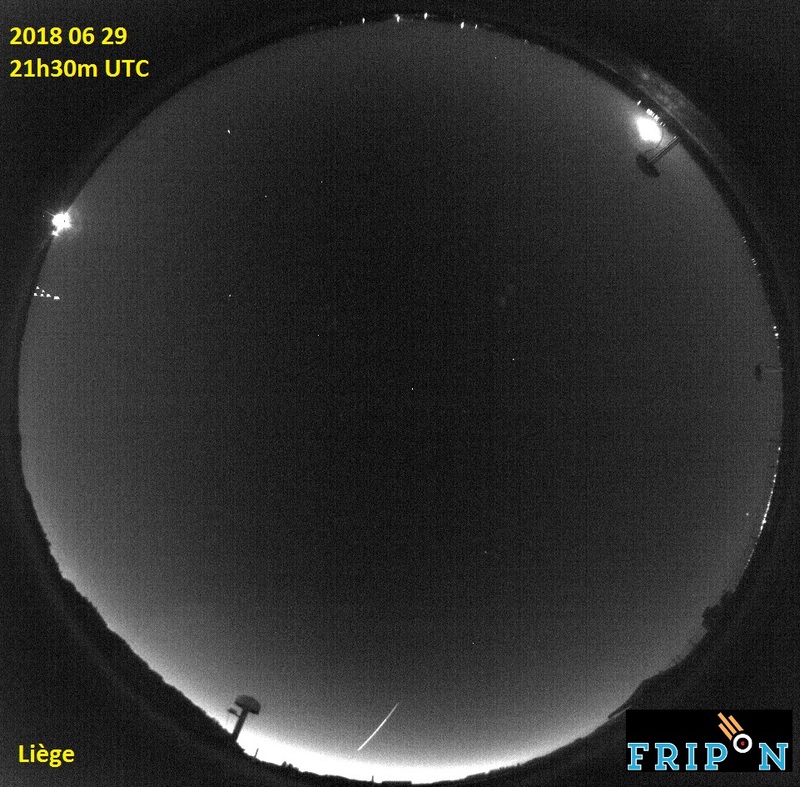 On 20 October 2017 around 00:37 UT, a fireball passed above Belgium and Netherlands. 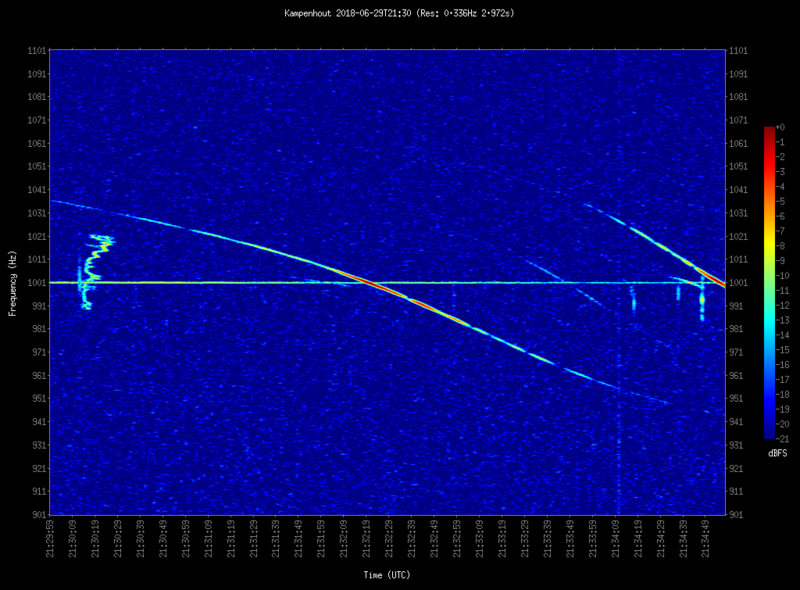 It was clearly detected by the FRIPON cameras in Brussels and Noordwijk. 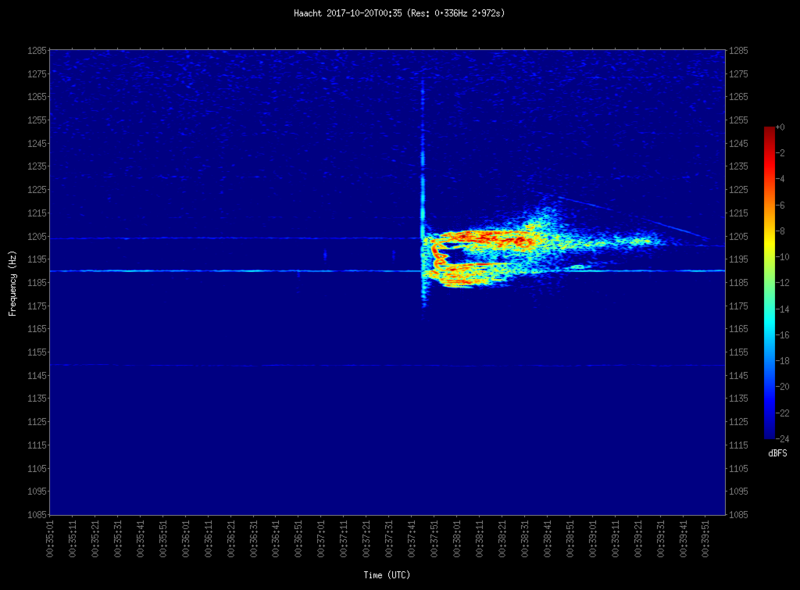 It was clearly detected by all BRAMS stations as a bright overdense meteor echo. Here are a few examples obtained at BELIEG, BEOPHA, BEUCCL, BEHAAC, BEOTTI and BEHOVE. 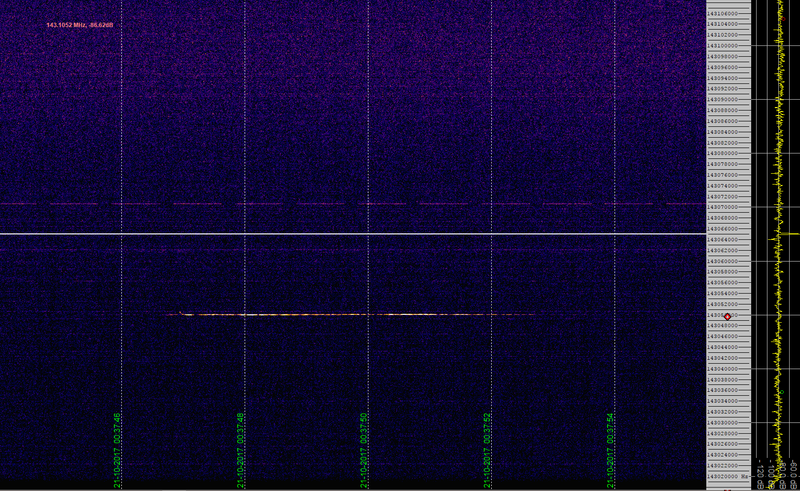 Note that it was so bright that the noise is barely visible on most spectrograms and that some saturation sometimes occurs. 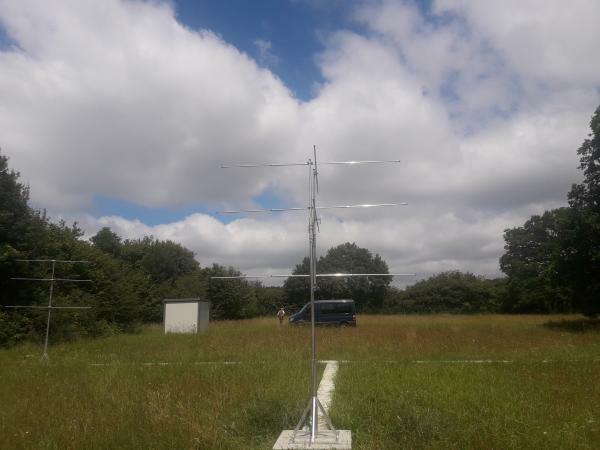 It was also detected by the recently added FRIPON radio antenna listening to the military radar located in Graves, near Dijon, and emitting at approximately 143 MHz. 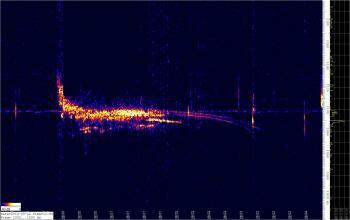 A trail echo is clearly visible for at least 6 seconds. No head echo was detected for this case. 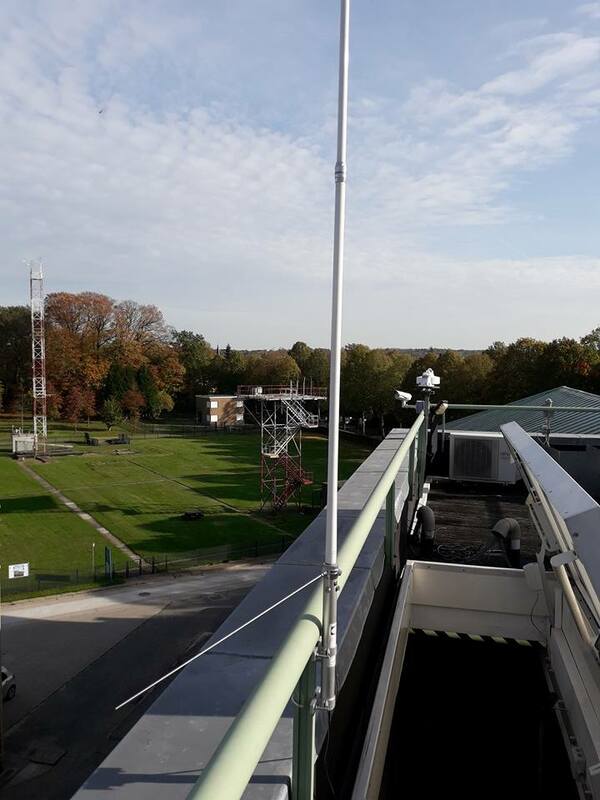 On 19 October 2017, we have installed a radio antenna on the roof of the institute in Uccle, as part of the FRIPON-radio project. On 29 August we went to Humain to measure very accurately the electric length of the RF cables from the antennas to the receivers. Since the interferometer works by measuring phase differences between antennas, systematic errors may occur due to the fact that the radio waves still need to travel along the cables. In these cables, the speed of propagation is only 2/3 of the speed of light and the wavelength is then of 4 meters. An error in the length of one cable of 20 cm would then introduce a systematic error on the phase of (20/400)*360 = 18 degrees. 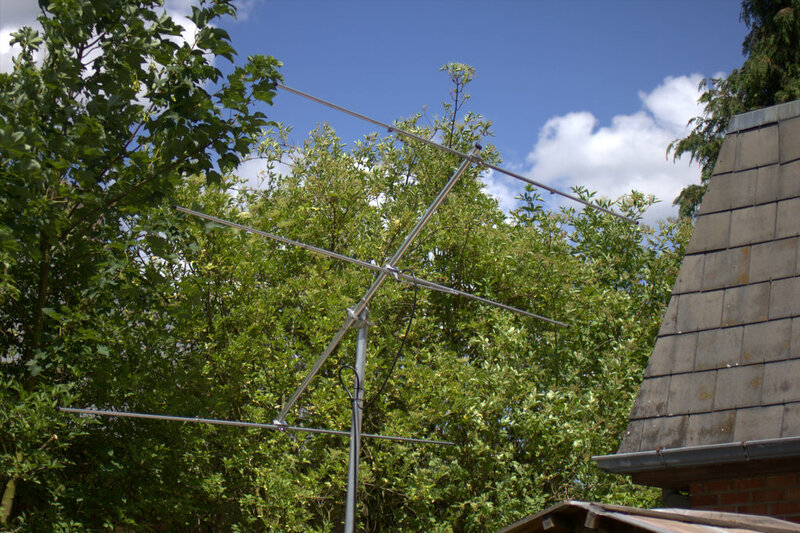 Since the antennas are located at different distances to the location with all receivers the length of the cables are naturally different. 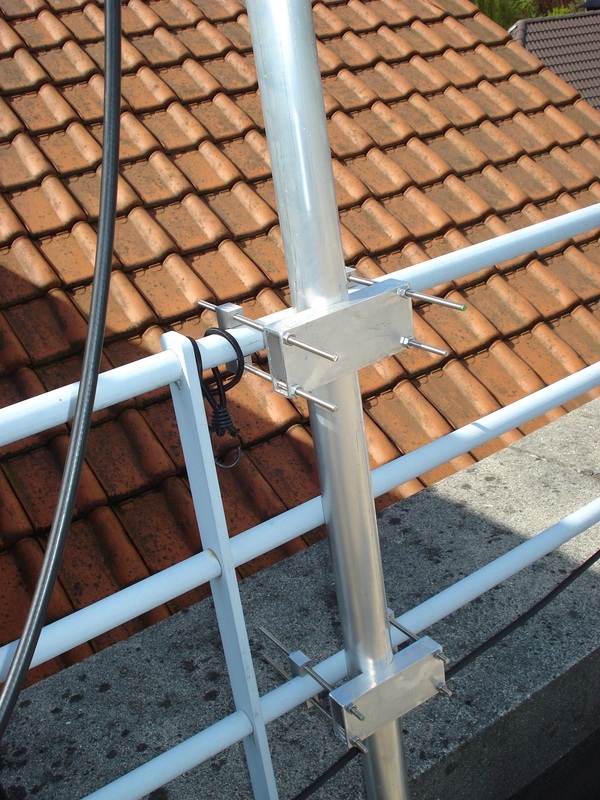 To compensate we have added an extra-length of cable at the bottom of the antennas when necessary. 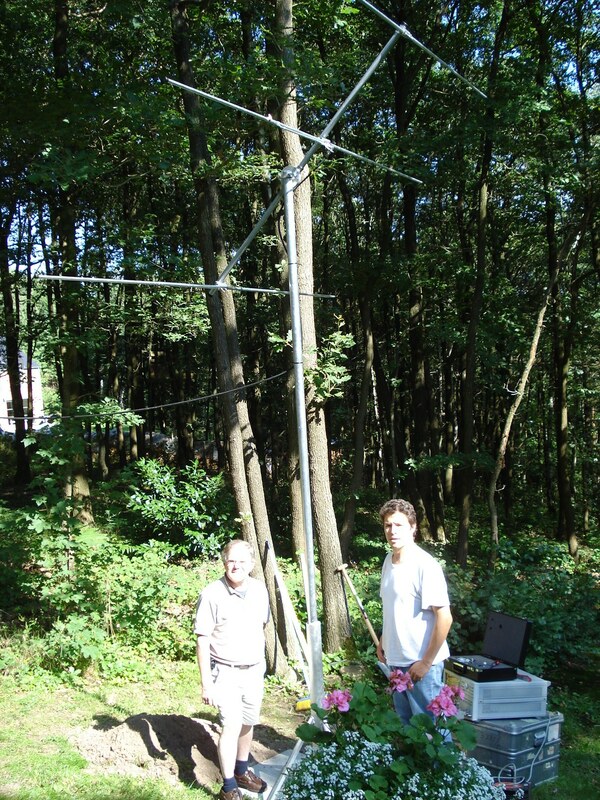 However, the accuracy cannot be better than 10-20 cm and therefore we needed to make these tests. 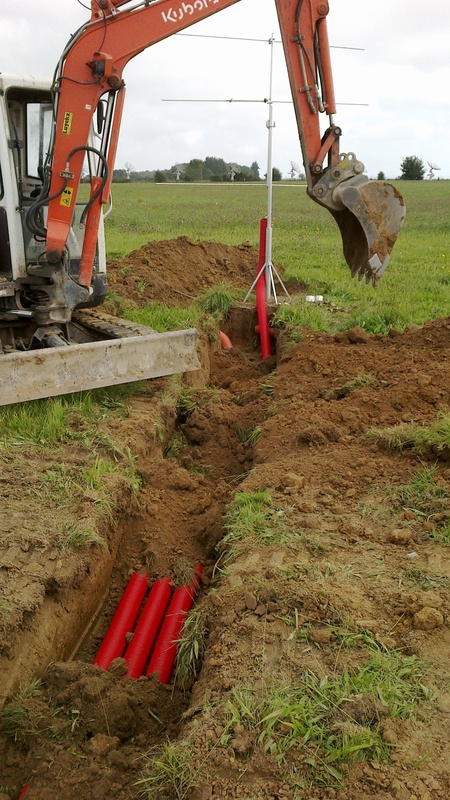 The electric length of the cables is basically measured by generating a square signal, taking its approximate derivative which has a very fast rising flank. This signal is sent into the cable, reflected at the end, and we measure the delay needed to travel the cable (twice) by detecting the same (delayed) rising flank. This was done using a counter, a generator and two directional couplers. The principle is sketched below. By repeating the measure on a very large number of flanks and integrating the results, the accuracy on the average delay is of the order of 4 picoseconds. The time delays measured between the rising flanks of the direct and reflected signals are typically of 250-252 nanoseconds. 250 nanoseconds corresponds to a length of around 50 meters. 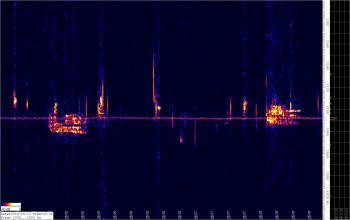 What matters are the small differences between the time delays measured between 2 antennas. These are systematic errors on phase delays that we need to take into account. 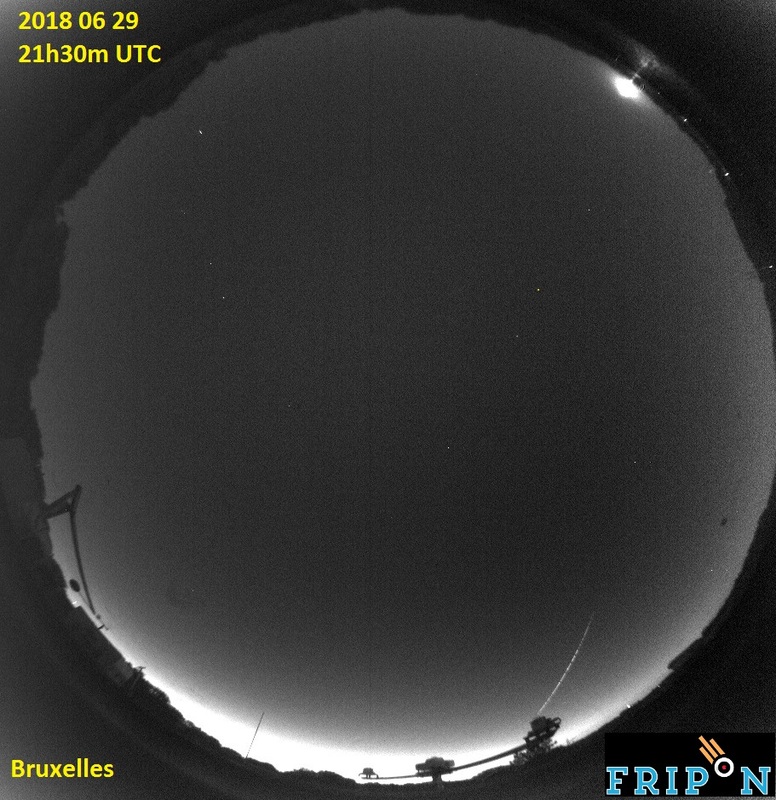 On 19 August, another fireball was detected by the FRIPON network including the camera in Uccle. 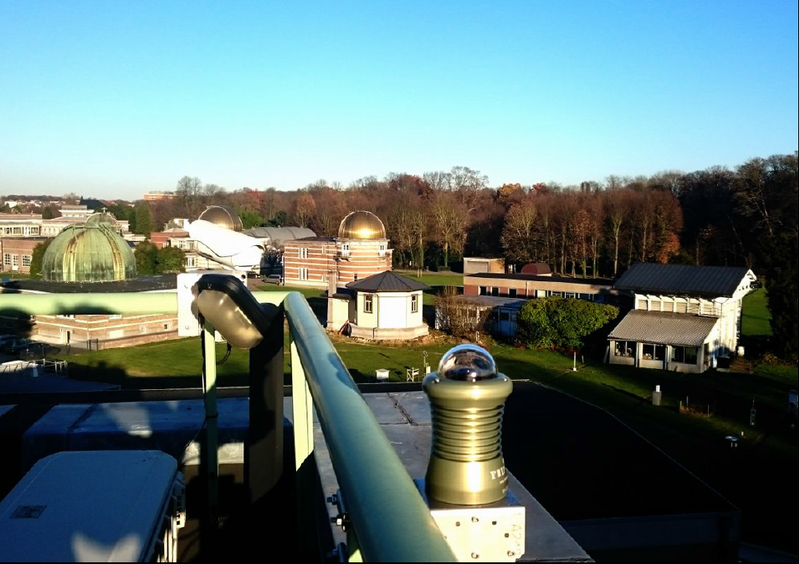 As part of the METRO project and an on-going international collaboration with IMCCE, we have installed a FRIPON camera on the roof of the institute in Uccle. 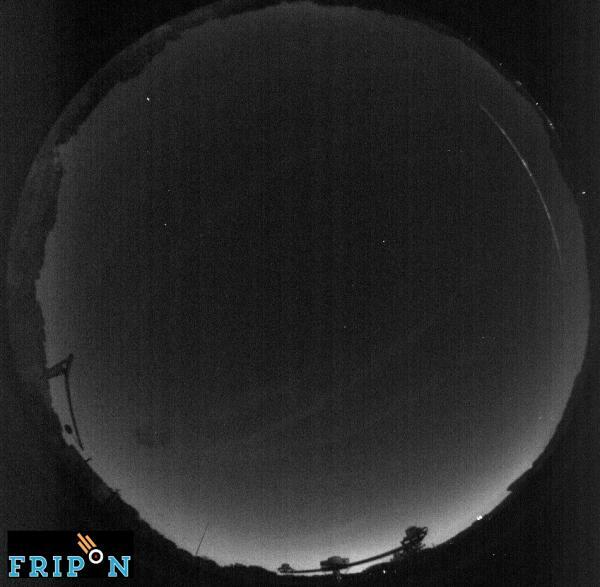 Last night, the very first detection of a fireball occured, also detected by the camera located at ESTEC in Noordwijk. 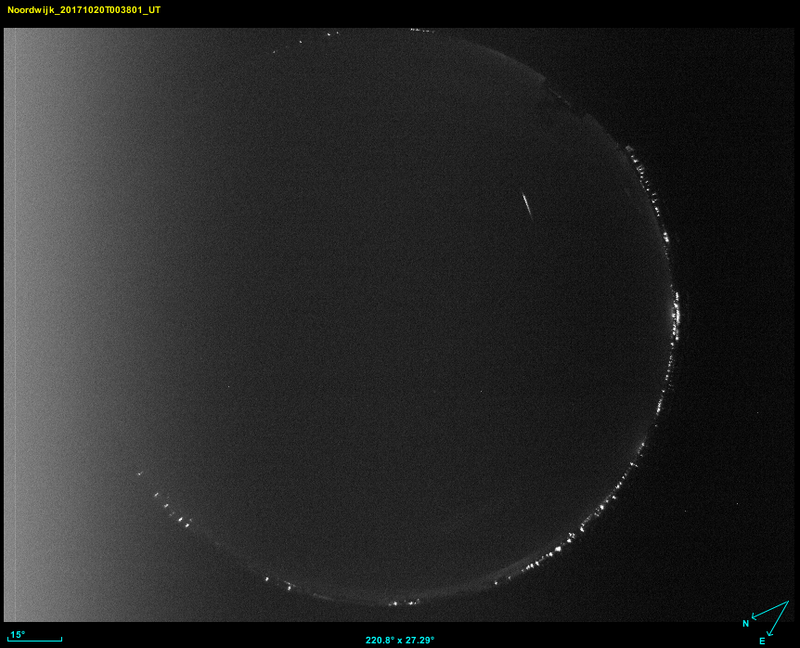 The Perseids are already coming back! The maximum of activity of the meteor shower is planned for 12-13 of August. The full Moon is on 7 August so conditions will not be optimal for visual observations. 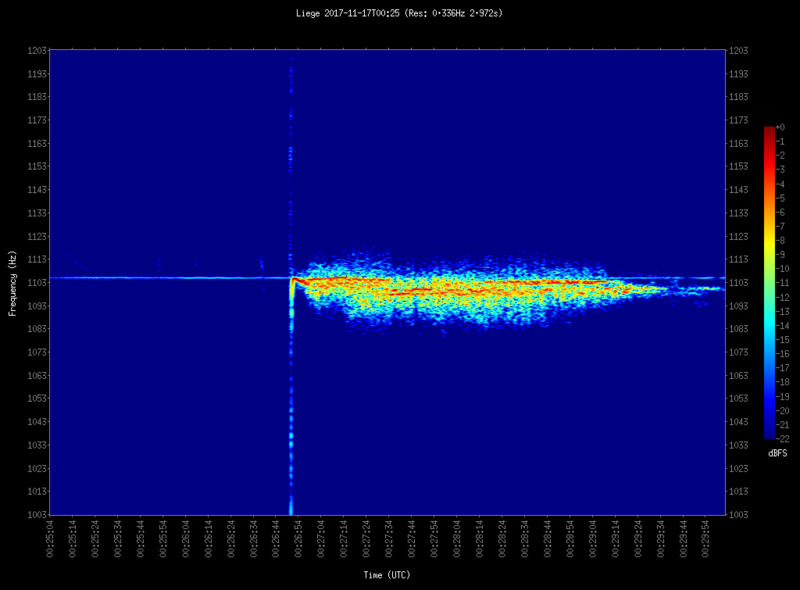 In this case radio observations are even more important. This year we would like to be able to produce an activity curve for one station by August 15. This is very challenging and for that we will need the help of many of you! One day of data consists of approximately 300 images. Each of them needs to be analyzed by 10 different users. We will provide images from 11 to 13 of August, one day at a time. So to obtain an activity curve on August 15, we will need about 9000 classifications in 3 days. If e.g. 1000 users are participating, that will be 9 classifications per user on average, or 3 images classified per day. Of course the more users the better! Data will be released on 12, 13 and 14 of August as we need to collect and prepare them for upload to the RMZ website. 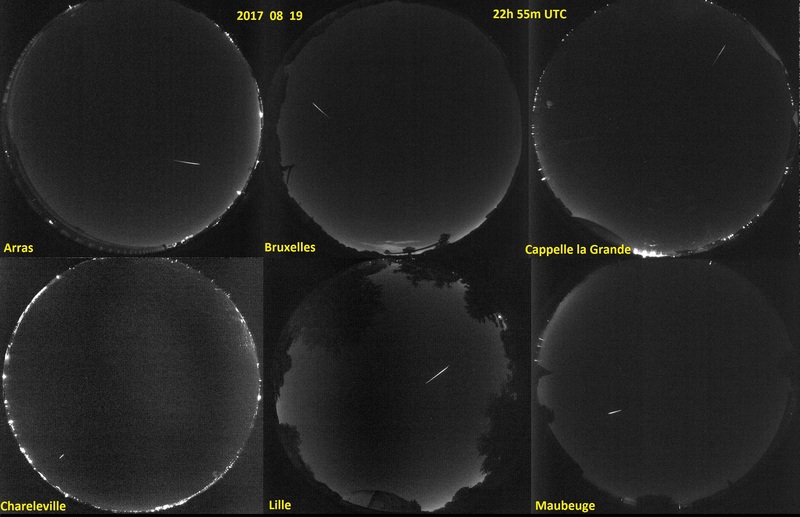 Meanwhile you can also help us by analyzing data from the same station obtained on 22 and 23 of July, during days when the Perseids were not active at all. 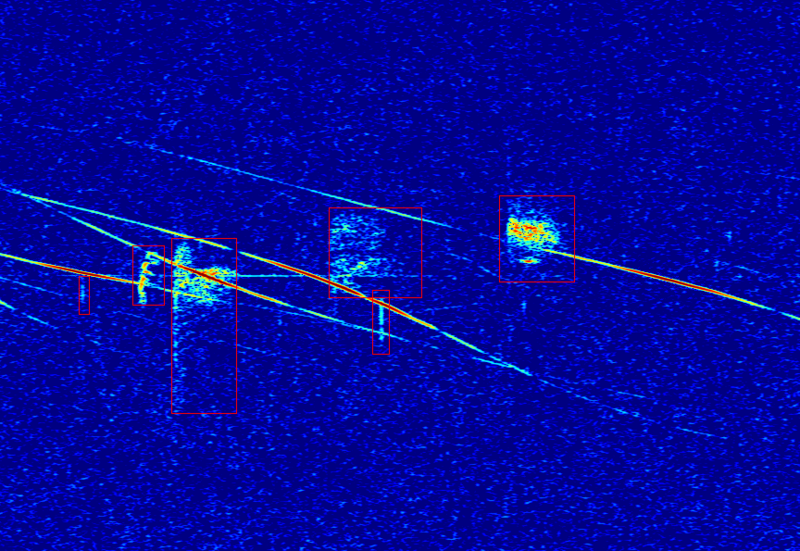 If these data are fully processed before the meteor shower, we will then be able to also subtract the background from the total activity. That is the ultimate goal for August 15. We hope to "see" as many of you as possible on August 12-14 and that between two classifications, you might also be able to spot a few shooting stars at your location. Last Friday, Hervé Lamy gave an internal seminar about the Radio Meteor Zoo. The presentation included the reasons why we started a Citizen Science project, how we collaborated with Zooniverse, how we deal with individual contributions from Zooniverse users and finally some preliminary results. The presentation is available here. 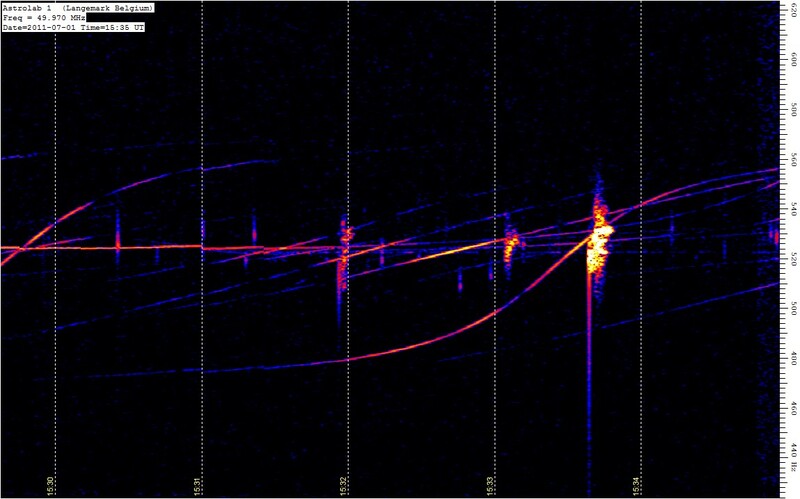 Using our online tool developed to draw rectangles around potential meteor echoes in spectrograms, manual counts between 18:00 UT on 12/08 and 14:00 on 13/08 were obtained. The figure below shows an example of a spectrogram where red rectangles have been manually drawn around meteor echoes. 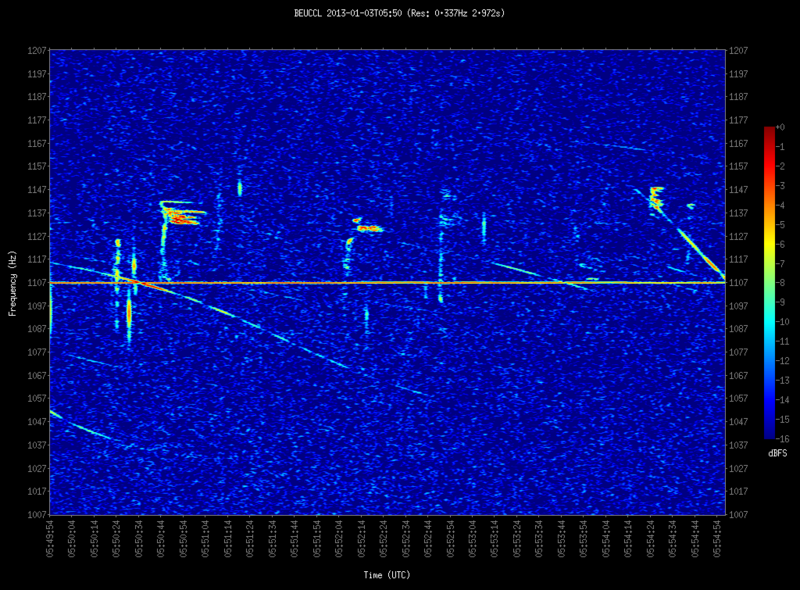 The raw counts (obtained for each spectrogram every 5 minutes) including all meteor echoes (long and short). 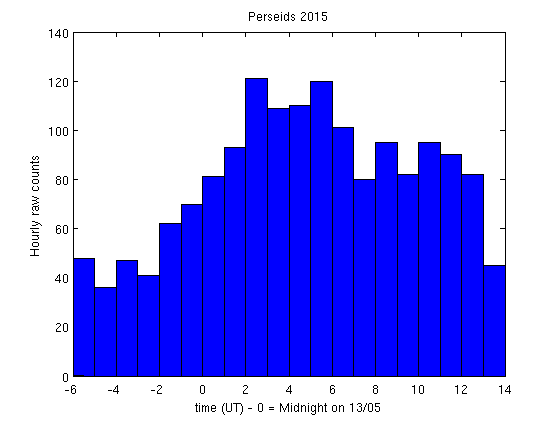 The peaks of the Perseids are nearly impossible to spot as the total number is a mix between Perseids and sporadics. 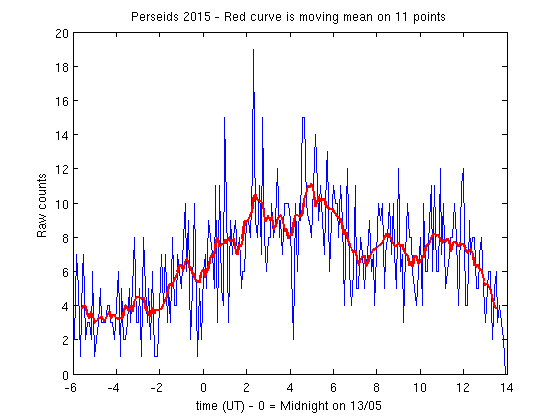 The red curve is a moving average on 11 points (so more or less 1 hour) and shows some peaks but not very clearly. 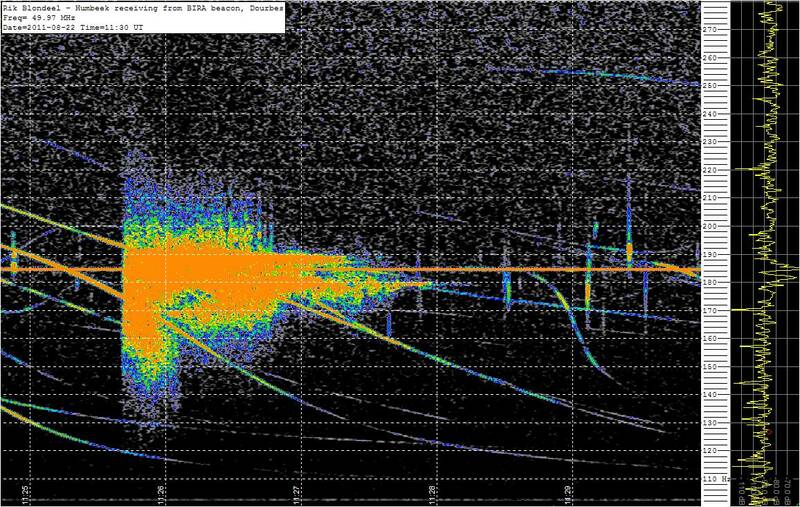 Hourly raw counts including all meteor echoes (long and short), simply obtained from the first curve by adding individual counts for all spectrograms in one hour. 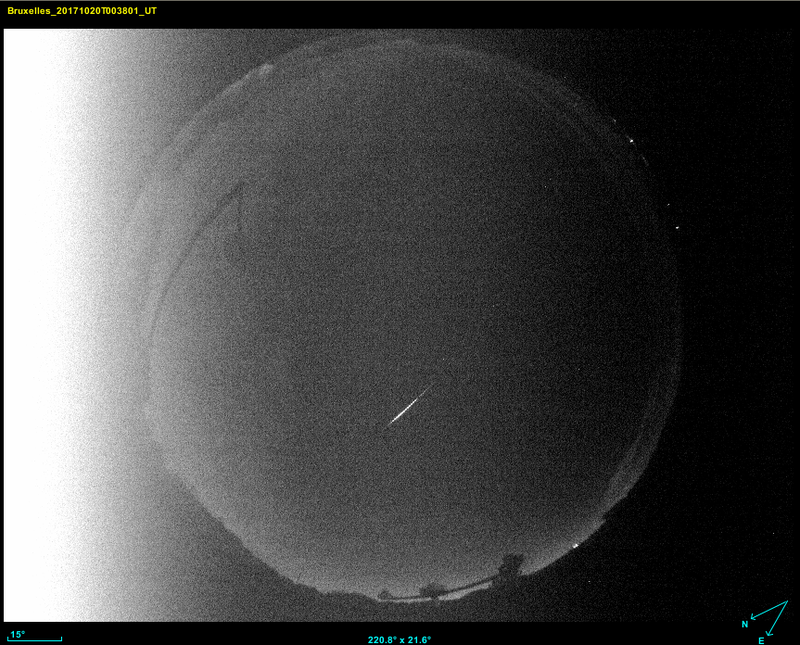 The peaks of the Perseids become visible but again not very clear. 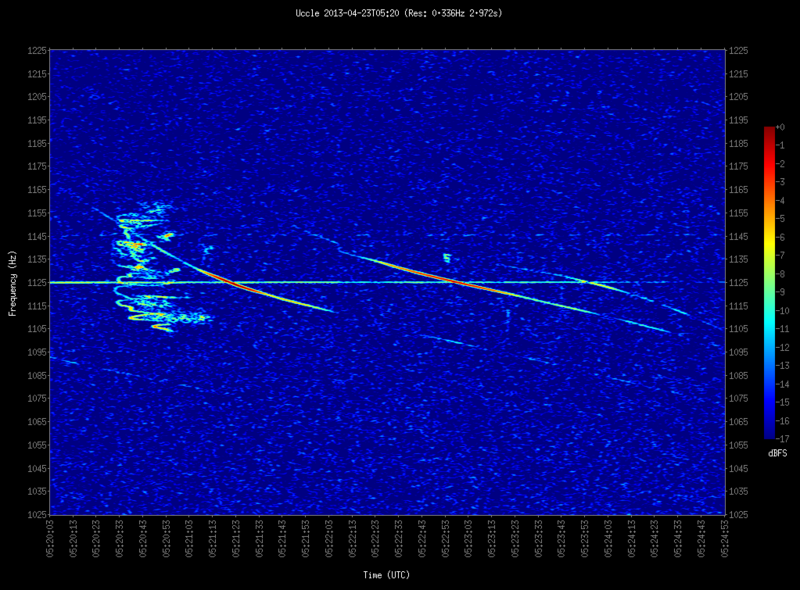 Hourly counts including only long meteor echoes. 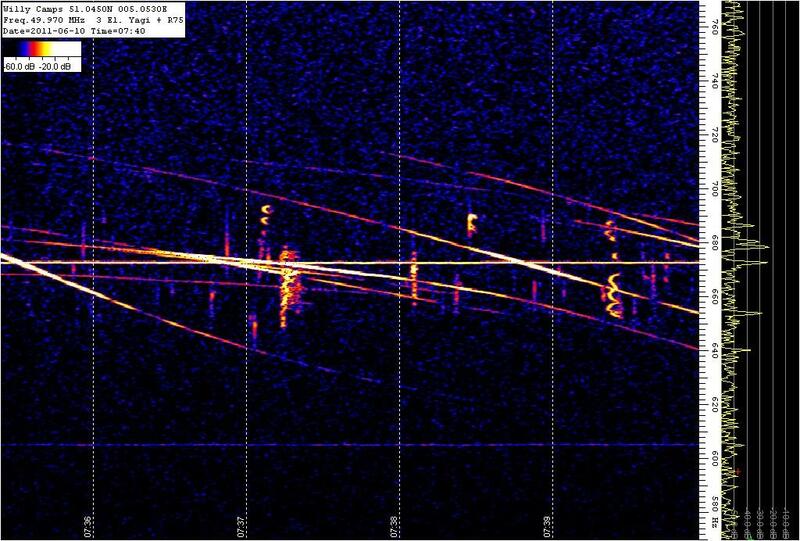 The definition of long is rather vague but includes basically all meteor echoes that have an horizontal extent in the spectrograms, indicating a long duration than typical short (underdense) meteor echoes that represent the bulk of the sporadic background. 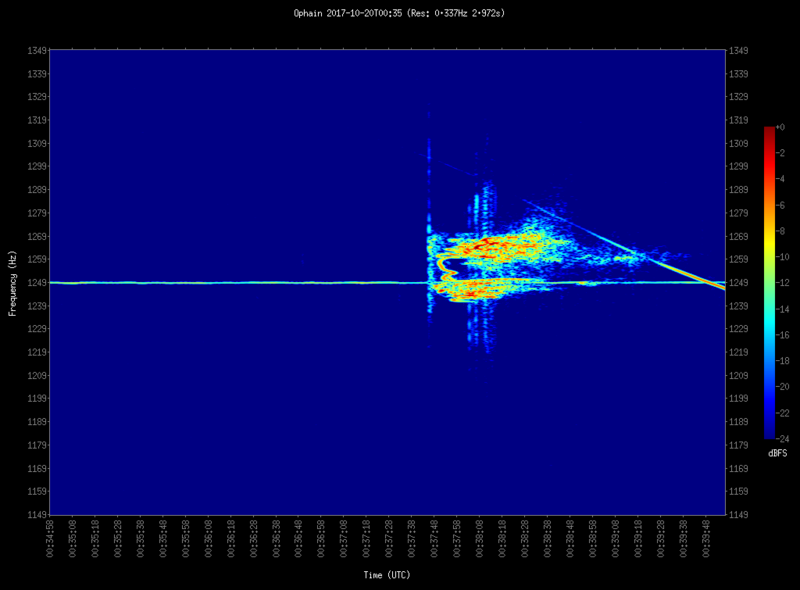 Then, in this plot, two peaks at ~ 5 UT and ~ 8 UT become visible. 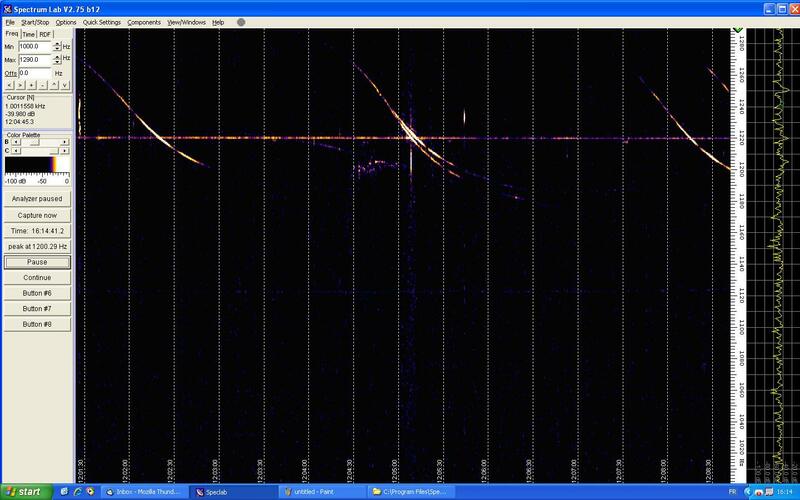 These are in agreement with meteor counts obtained by Felix Verbelen using the Ypres beacon at 49.99 MHz. It would be nice to compare these observations with visual observations (see e.g. this page at IMO). 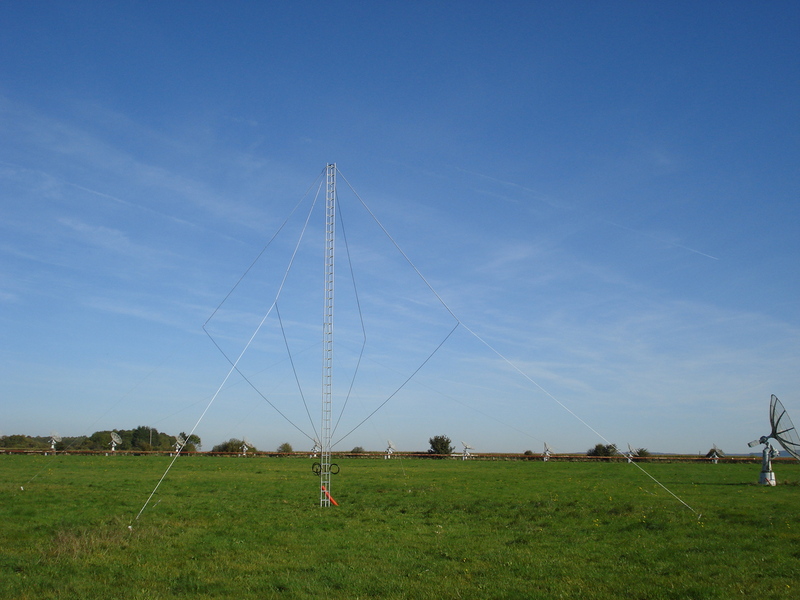 Due to additional tests with the UAV equipped with a transmitter, the BRAMS beacon was temporarily switched off on 17/08 between 10:04 UT and 14:58 UT. 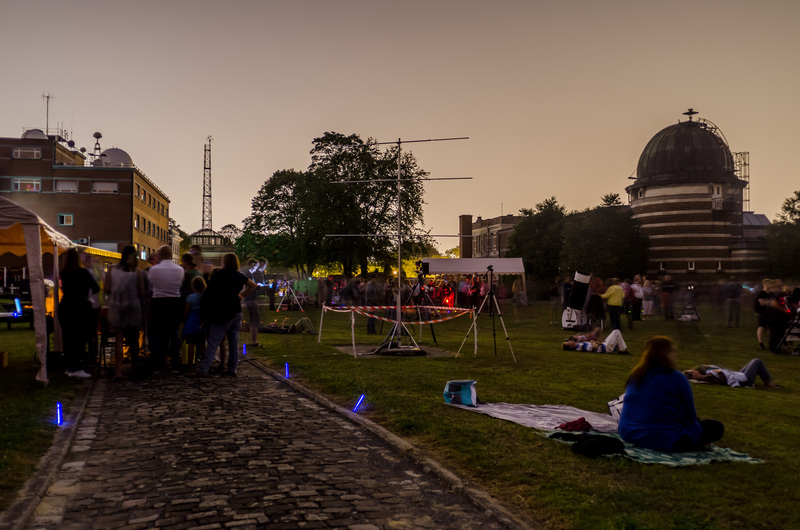 On the night of 12 August 2015, the Planetarium and the Royal Observatory of Belgium (ROB) were organizing night-sky observations on the plateau of Uccle during the Perseids 2015. About 500 people visited the site between 10 PM and 1 AM. We ran a BRAMS demo as well which was very successful. Due to lightnings near Dourbes, the beacon was temporarily off betwen 17h53 and 18h37 UT on 07/08/2015. Due to violent lightnings near Dourbes, the fuses in the house hosting our instruments were down and had to be manually switched on the next morning. 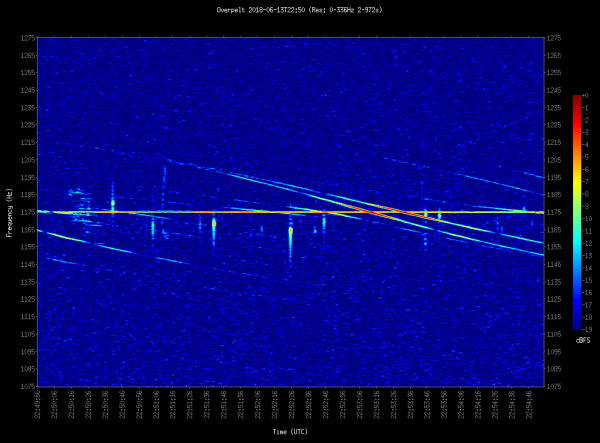 The beacon was off between 23:12 UT on 18th July and 10:08 UT on 19th July. The beacon in Dourbes has been switched on again. Tests with the drone are finished. 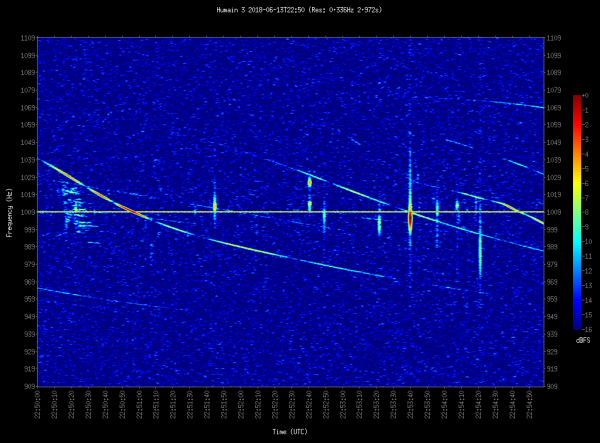 The beacon was off from 1st of July around 11:55 UT until 14:10 UT on 3rd of July. The drone was flying in the far-field of our antenna. 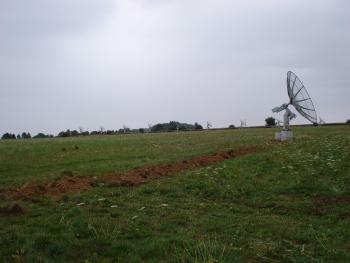 The far field is approximately located at ~ 2 D^2/lambda with D being the largest size of the antenna. In our case, with a 8m x 8m grid, D is equal to the diagonal of the reflecting grid and therefore the far field is located at approximately 43m. 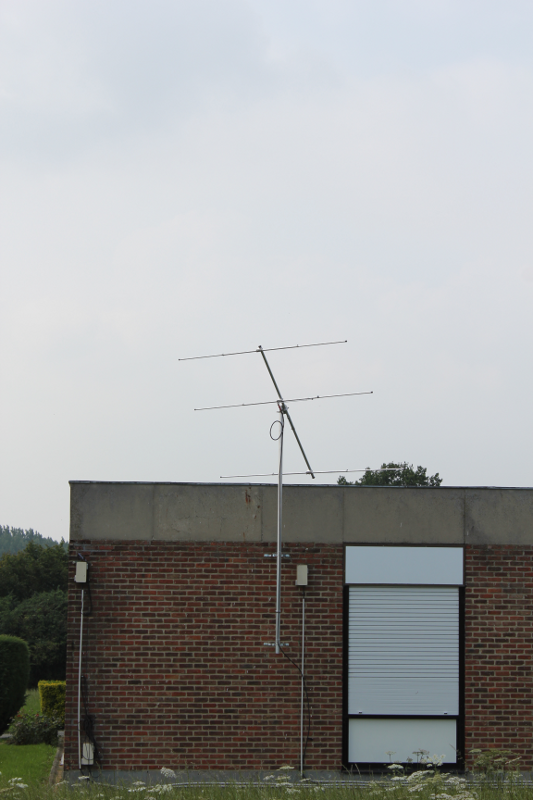 The drone was flying in circles at a distance of 50 m from the bottom of the antenna. Each circle was carried out at a different elevation (between 30° and 80° with steps of 10°). 30° was the minimal elevation to be sure that the drone was flying way above the tallest trees nearby. For each circle, 36 positions were considered to span the whole azimuth angles with steps of 10°. The drone was staying 15 seconds at each position. Below is a picture of the drone flying above the nearby trees. Calibration tests are planned in Dourbes on July 2 & 3 to obtain the radiation pattern of our transmitter using our drone. Since the transmitter in this case is used as a receiver and the drone carries the transmitter (amplitude calibrator developed at BISA), we will have to switch off the beacon from time to time. Tests may continue on Friday if necessary. On 28/04/2015, a new BRAMS station has been successfully installed in Maasmechelen. Thanks to Bjorn Di Paolo for helping us install and hosting the BRAMS station. 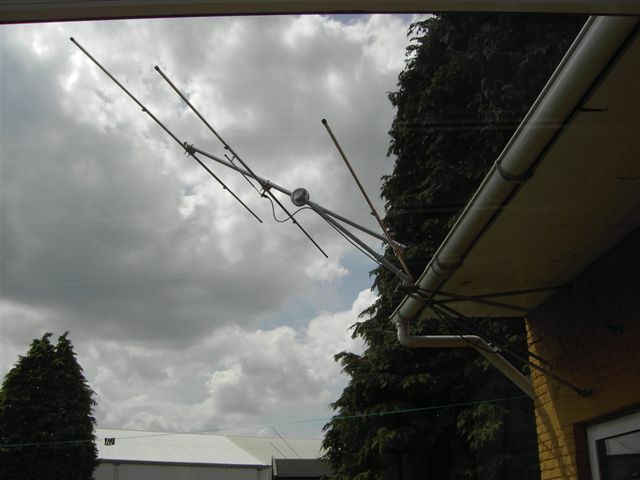 As can be seen, antennas will from now on be installed vertically. 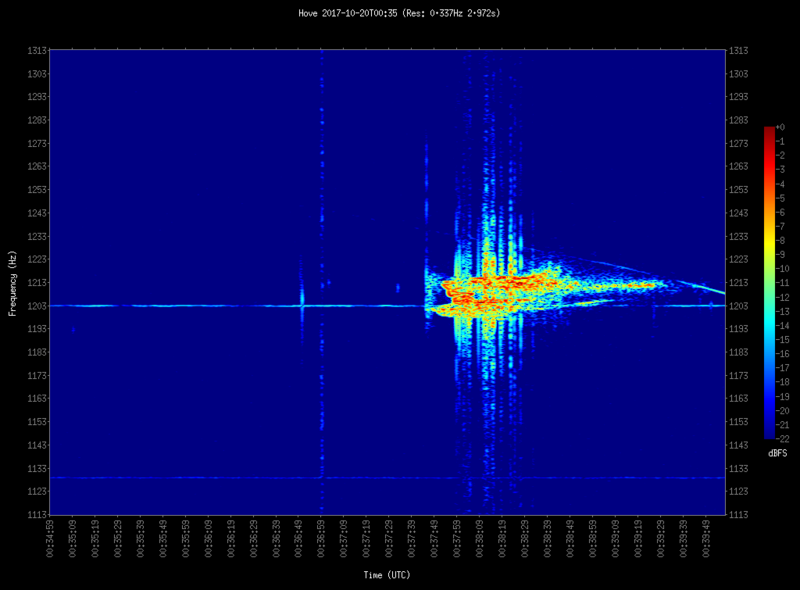 We have also installed the amplitude calibrator that will progressively be added to all BRAMS stations. 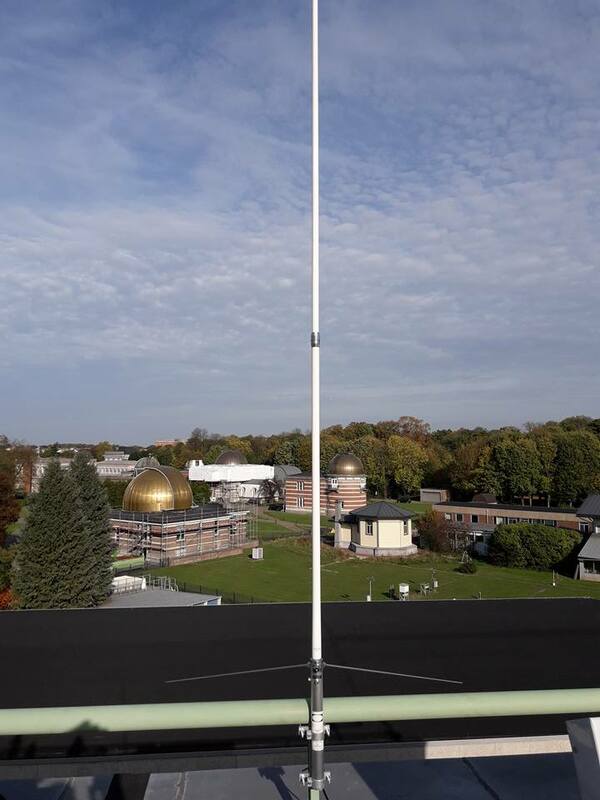 The antenna at the BEUCCL station has been replaced today at around 2 PM LT. 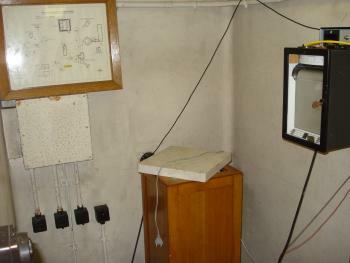 The old antenna was there from the beginning and was built in-house. We have now replaced it with a commercial one. The quality of the signal is much better. Because commercial antennas use UHF connectors and not N connectors (like the older one), we temporarily use two adapters : a N-BNC connector followed by a BNC-UHF connector. A N-UHF connector has been ordered and will be added soon. In the framework of the STCE, we have hired Antonio Martinez to calibrate the BRAMS antennas (and some antennas for solar applications in Humain). As presented during the annual BRAMS meeting, the method is to use a UAV/drone equipped with a transmitter sending a given power at a given frequency. The drone can fly in GPS-controlled mode, meaning that it goes to some specific locations pre-registered in its memory. 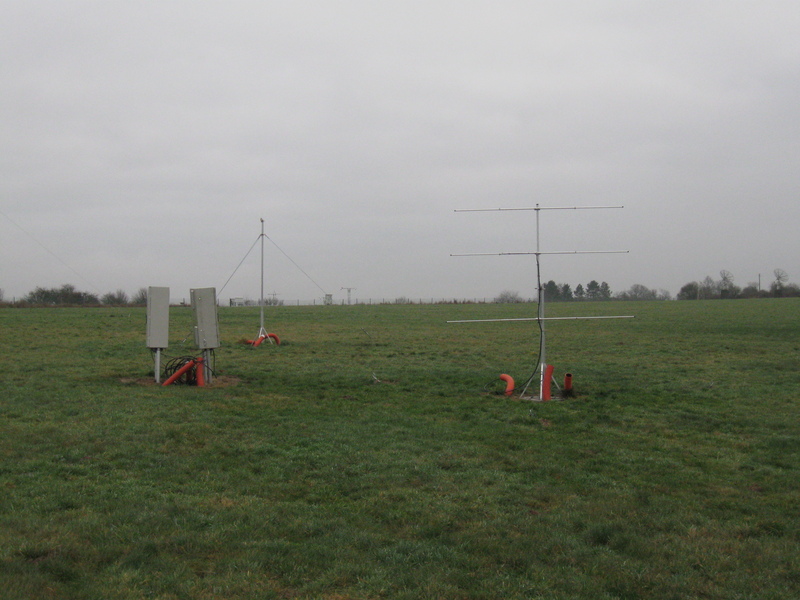 These locations are chosen in order to be in the far-field of the antenna (typically 3 meters for the BRAMS antennas but we will fly a bit further). 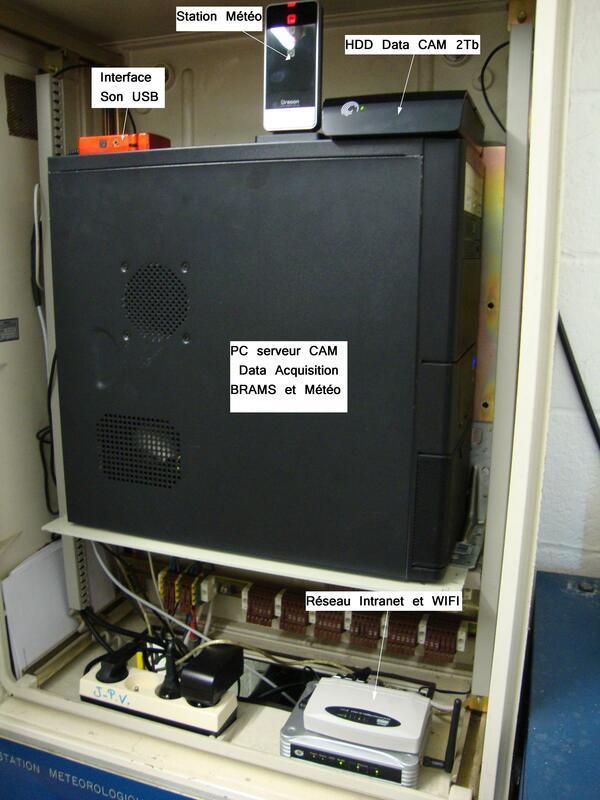 The transmitter has been designed at BISA and is ready. 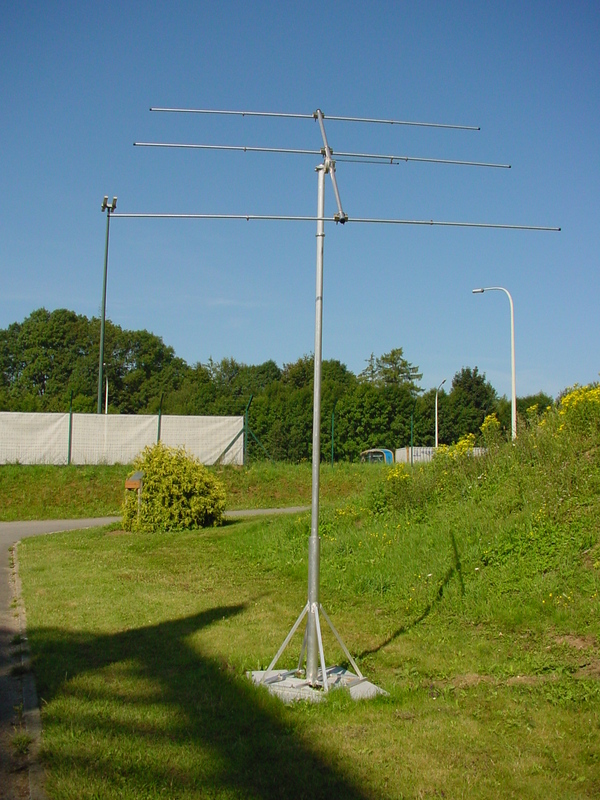 It will be added very soon as payload below the drone together with a small dipole-like antenna. 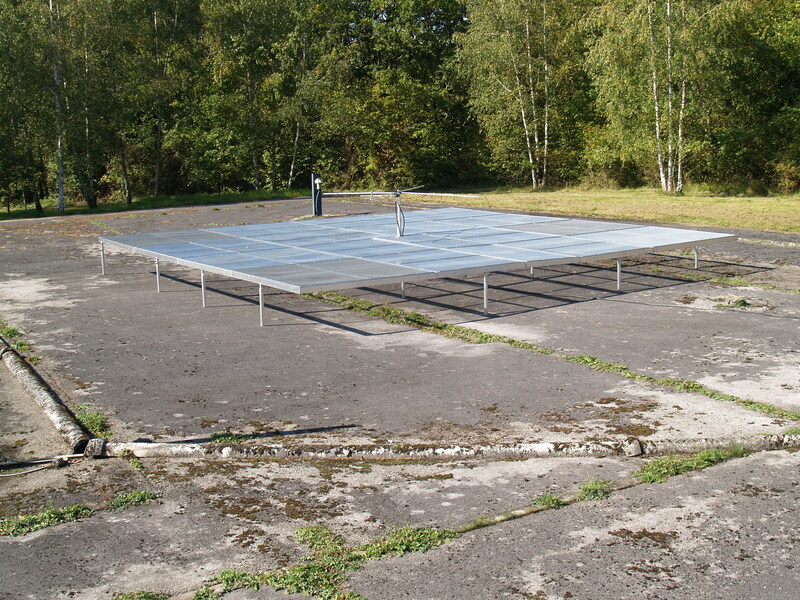 In order to prevent the modification of the radiation pattern of this emitting antenna by the metallic arms of the drone, a small grid (attached to a cardboard) has been added to the drone to act as a reflecting plane. The two pictures below show the remote control system of the drone as well as the box containing the transmitter that we will use as payload (as well as a battery). Dear all, apologies for the beacon being off this morning. This time, it was on purpose as we had to make some measurements and tests there. UPS is indeed dead but we found the way to automatically restart the signal generator in the correct configuration. So in principle we should not have anymore long periods without signals. We also found a place to install the FRIPON camera in the future. 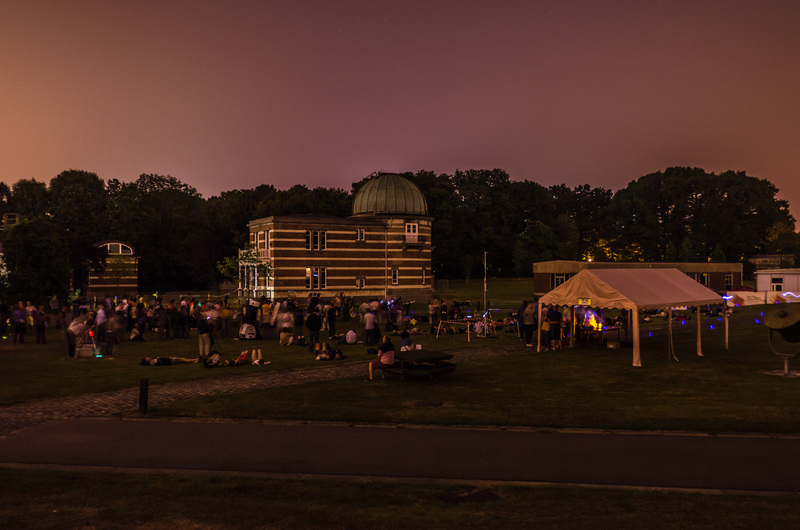 The BRAMS annual meeting will be organized at the MIRA observatory in Grimbergen on Saturday 5 April 2014 from 09:30 AM to 12:30 PM. We would like to thank the people at the MIRA observatory to welcome us once again. The detailed programme will be published soon. Everyone is welcome to participate. On Thursday 30 January 2014, we had the pleasure to welcome our French colleagues from IMCCE (Paris, France) at BISA : François Colas presented the French optical network FRIPON (Fireball Recovery and InterPlanetary Observation Network) while Jérémie Vaubaillon presented CABERNET (The CAmera for BEtter Resolution NETwork). The presentation of FRIPON can be downloaded here. Some technical details about the FRIPON cameras can be found here. The afternoon was devoted to radar observations. The status and recent developments of BRAMS were presented. The presentation can be downloaded here. 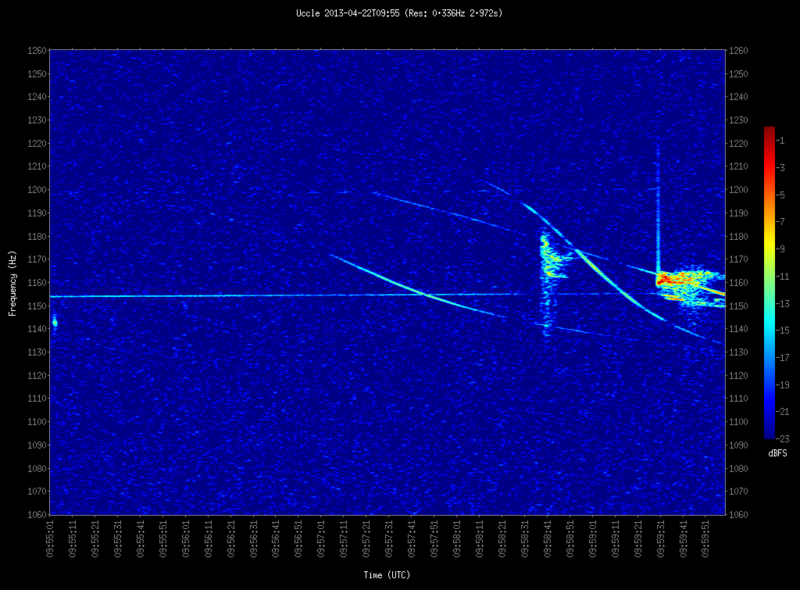 Jean-Louis Rault finally presented a comparison of meteor observations with analog and digital (SDR) receivers. You can also download his presentation. The goal of the workshop was to discuss about the complementarity of the BRAMS and FRIPON networks and to see how FRIPON can be extended to Belgium. 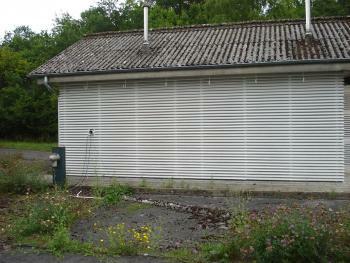 It has been decided to add a few fish-eye cameras in Belgium under the responsability of BISA. 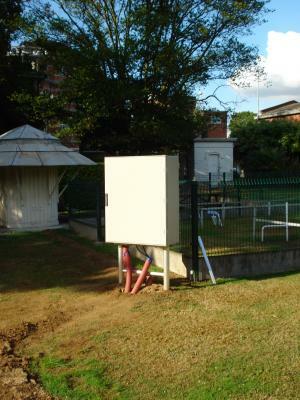 The first camera will be located in Uccle. Other places will be University of Liège and Centre de Géophysique du Globe in Dourbes. The 8m x 8m metallic grid has been installed in Dourbes. Very nice job from our engineering staff. 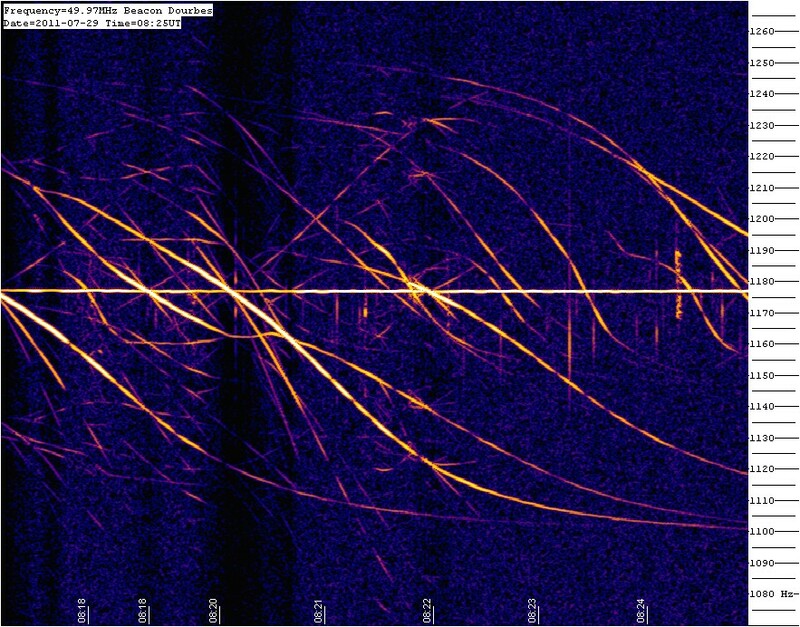 Now we try to analyze the influence of this change of the radiation pattern on the number of plane echoes, their intensity and on the intensity of the carrier. Thank you to Francesco Lo Bue and Peter Meurisse for hosting the station at the University of Mons and helping us to install the material. Thank you to Rik Blondeel for setting up and hosting the station in Humbeek. 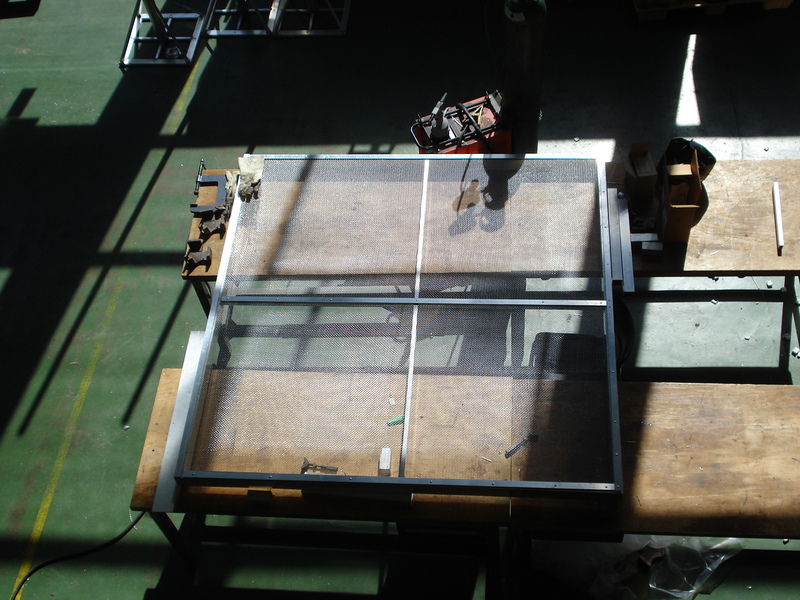 Our engineering team in the workshop has now started building a 8m x 8m metallic grid which will strongly improve the radiation pattern of the beacon antenna. Currently too much power is emitted at small elevation angle resulting in a very intense carrier signal and a lot of strong plane echoes. With this grid, the situation will improve a lot (see tests in the news from 07/06/2011). 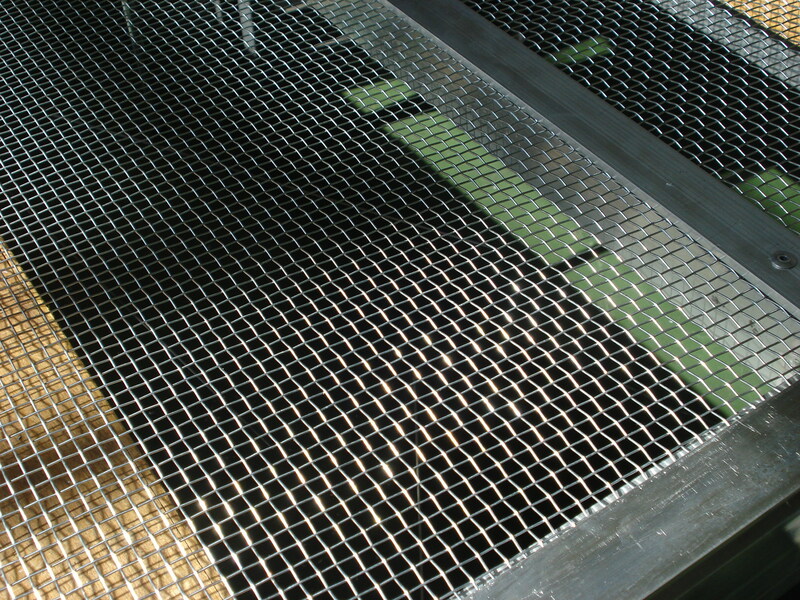 Below are two pics of one 2m x 2m block of the future metallic grid. The picture on the right is a picture from above. Thank you to Stijn Calders and Urania to host the station in Hove, and to Patrick Mertens to host the station in Corbais. This station has been installed a few months ago but here is a picture. 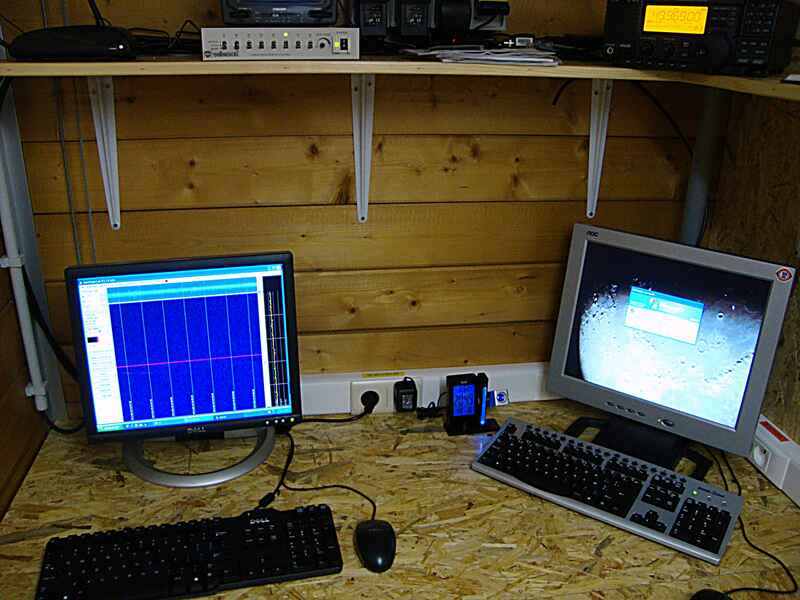 Thanks to Marteen Vanleenhove for providing this picture and hosting the station. 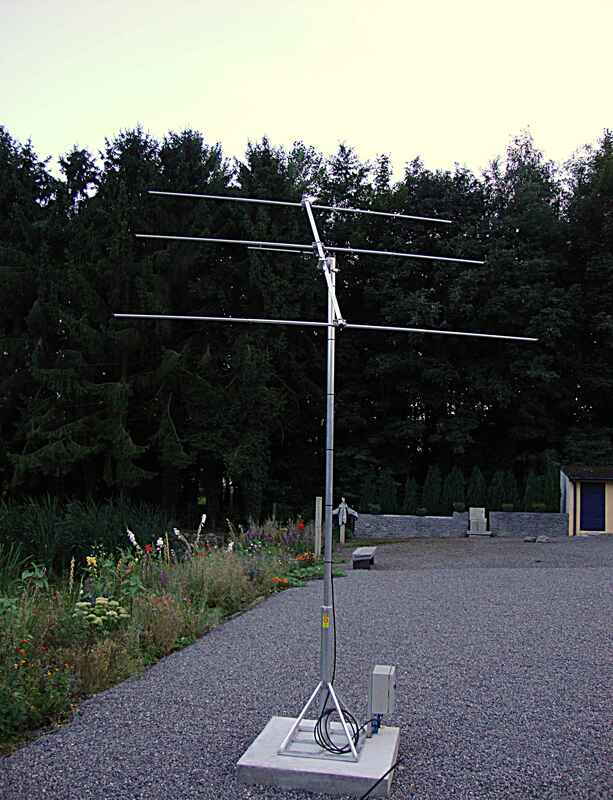 Another station has been installed at the Euro Space Center. Thank you very much to Dominique Gering for hosting the station and helping with the installation. 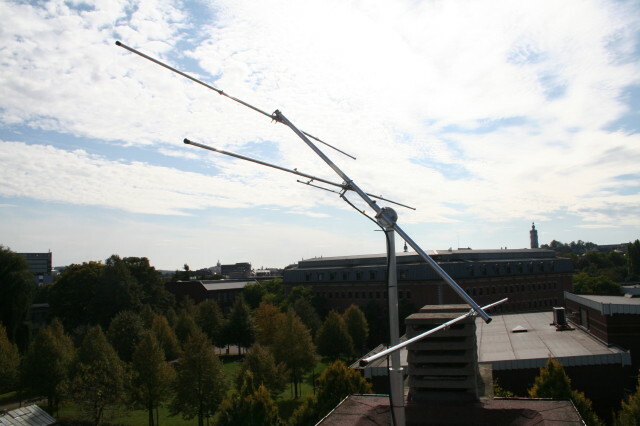 Below you can find pictures of the antenna. 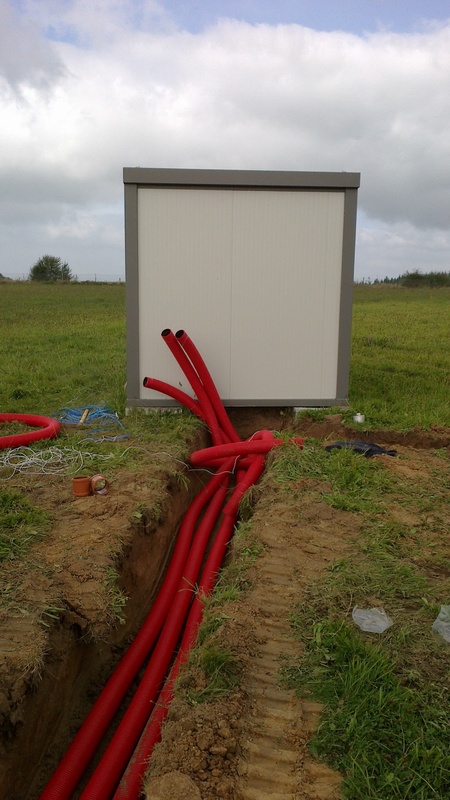 Another station has been installed in Jalhay for the GAS ( Groupe d'Astronomie de Spa. Thank you very much to Christian Francise and Emmanuel Jehin for hosting the station and/or helping with the installation. 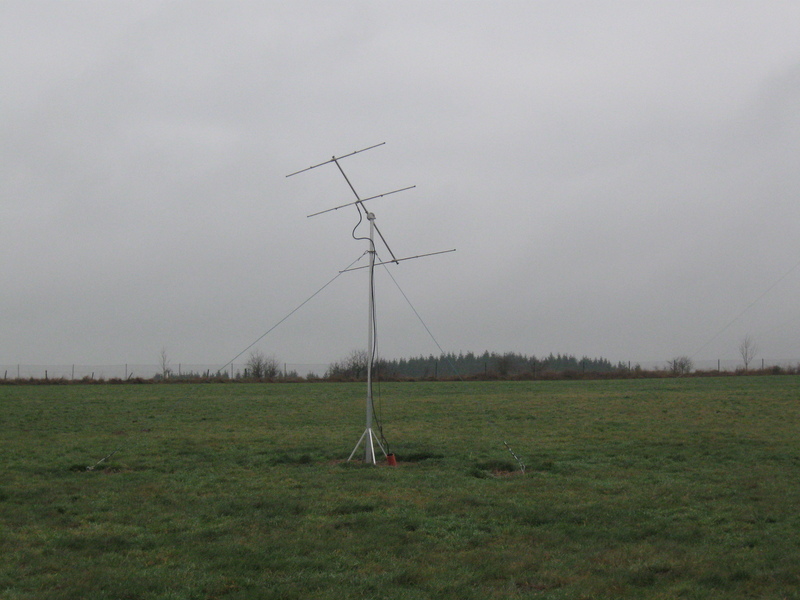 Below you can find pictures of the antenna and first "lights". 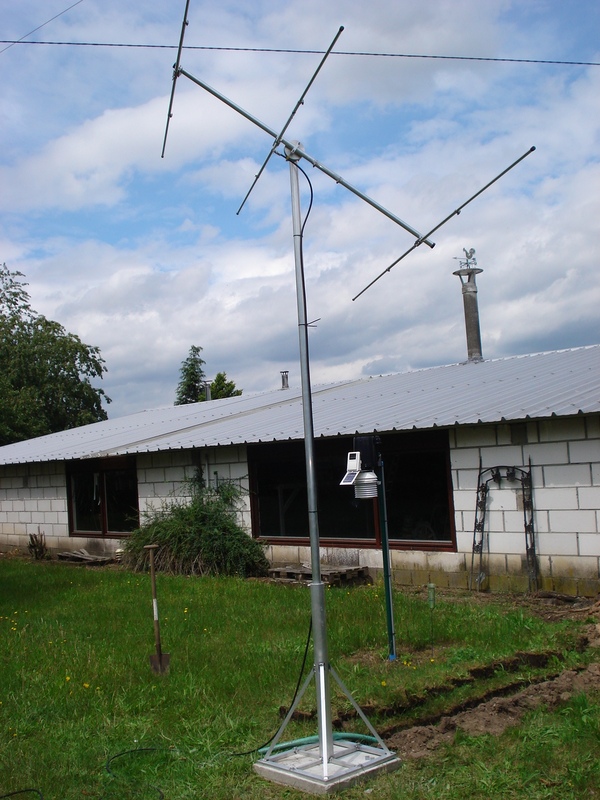 Another station has been installed in Ophain on the site of CCRM. 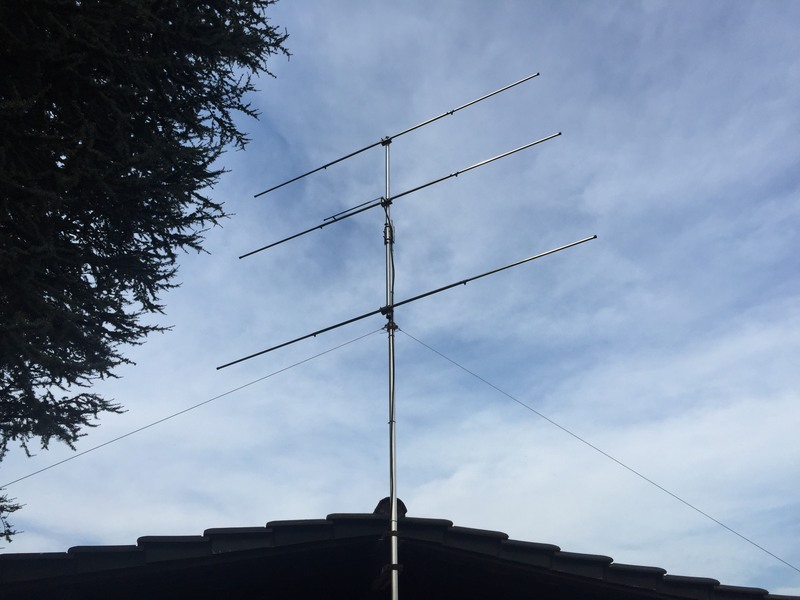 Thank you very much to Christophe Visée for this installation and for providing me the pictures below : a picture of the antenna and a first "light". 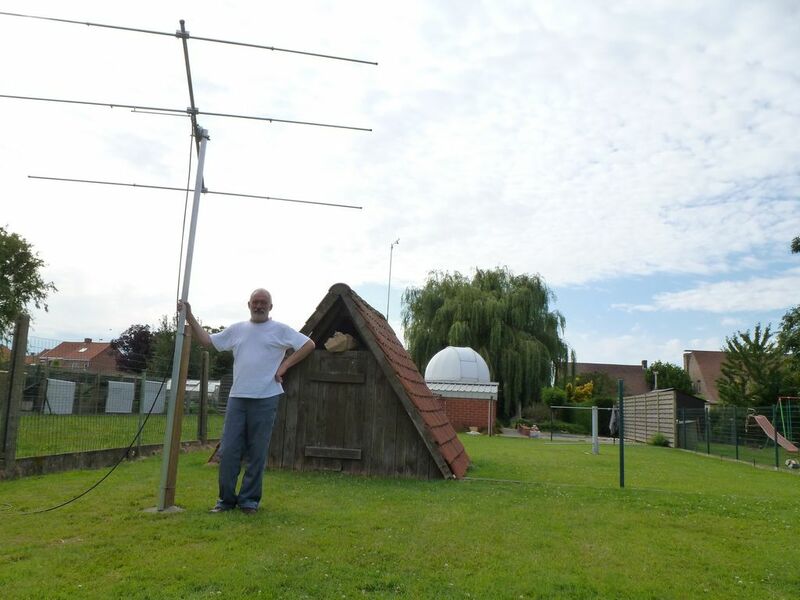 Another station has been installed by Franky Dubois in Langemark. Thank you so much. 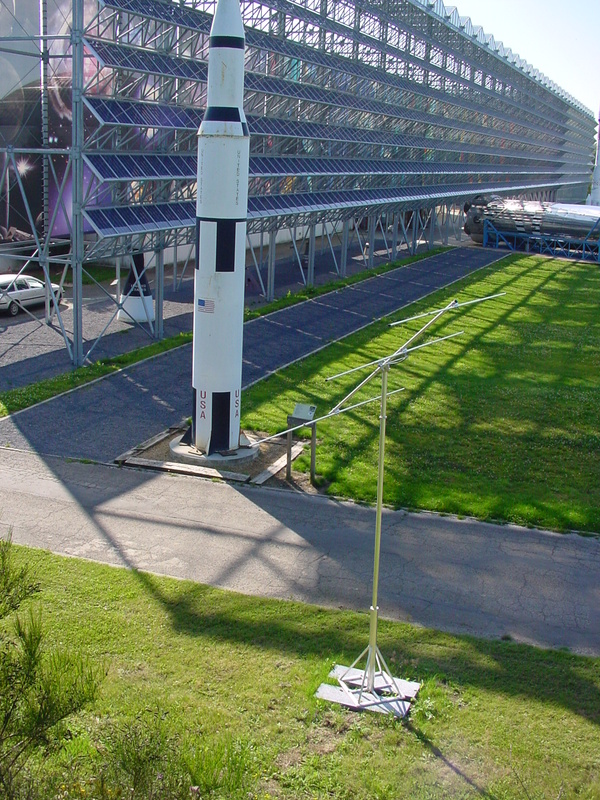 Below is a picture of the antenna and a first "light". There is also a link to Franky's website about BRAMS. Another one will be published soon (August?) in La Libre Belgique. The receiving station is nearly ready in Neuchateau. Only the PC must be installed and configured. The first tests will be done in about 2 weeks. 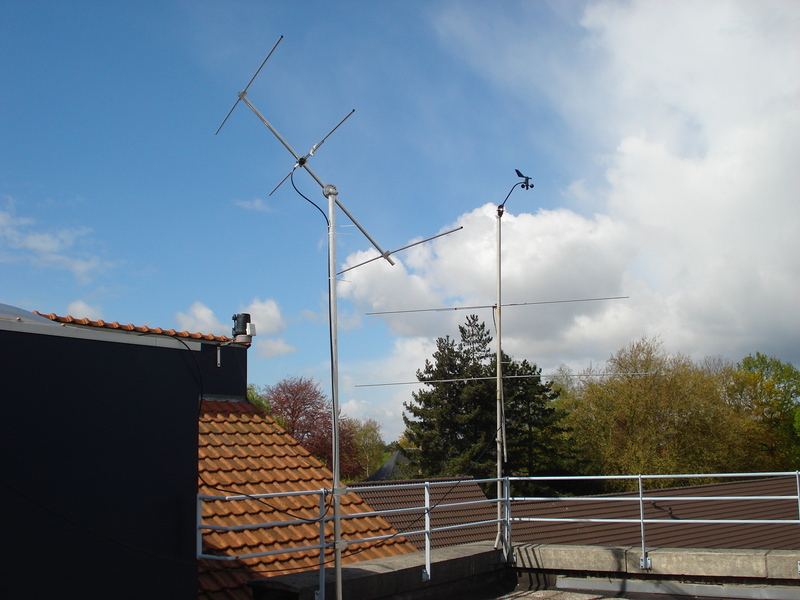 Below is a picture of the antenna and of the nice installations of the OCA (Observatoire Centre Ardennes). 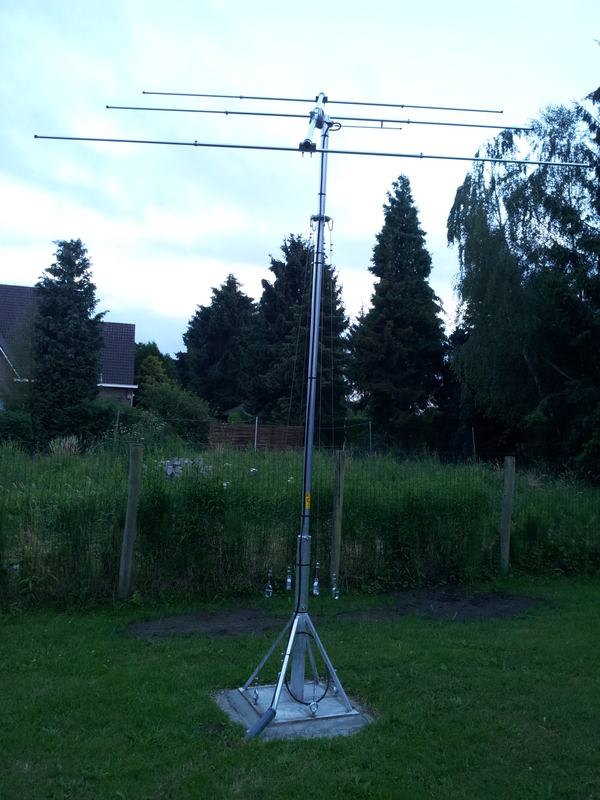 A new station has been installed recently by Patrick Luyten in Ramsel. We have also installed a station in Overpelt. Pictures below. Thanks to Patrick and Lucas Pellens. Two new stations have been installed recently by the users themselves in Lembeek and Tessenderlo. Thanks respectively to Roland Oeyen and Willy Camps for setting up the stations. 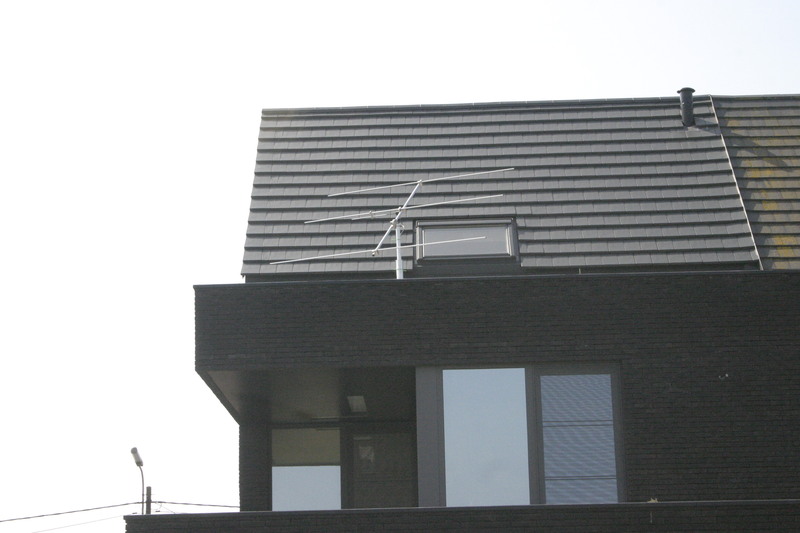 Below you can see pictures of their installations as well as some snapshots obtained with SpectrumLab (Lembeek on top, Tessenderlo in the bottom). 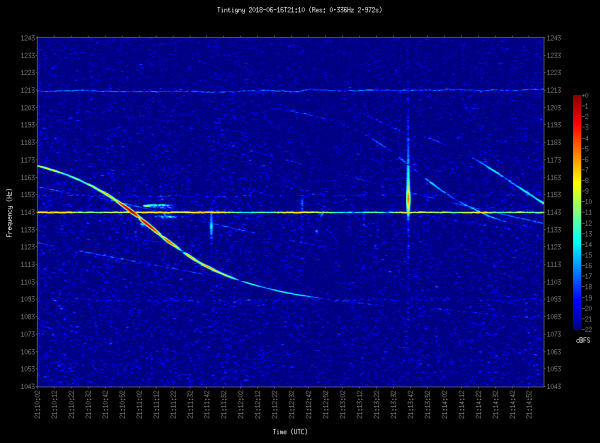 This morning, an M2.5 solar flare peaked at 06:30 UT. 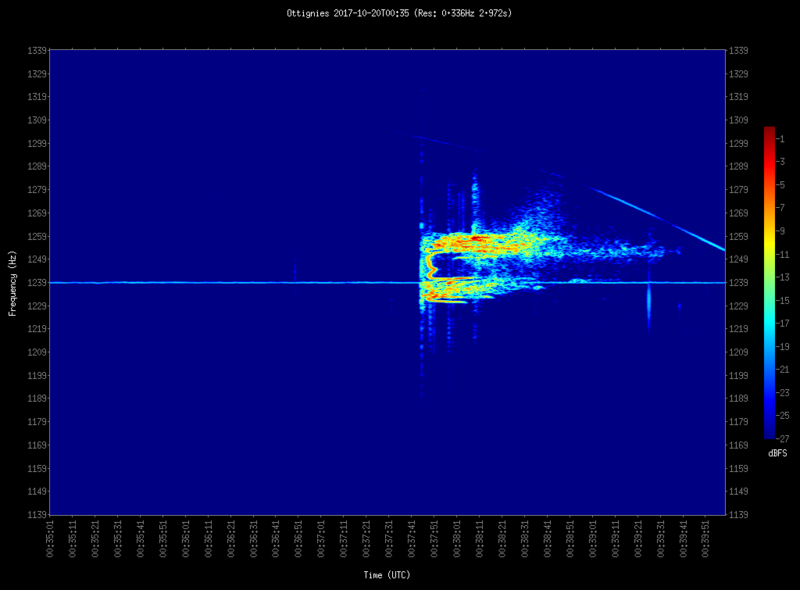 It was visible on BRAMS data. Thanks to Felix Verbelen for sending us this picture. 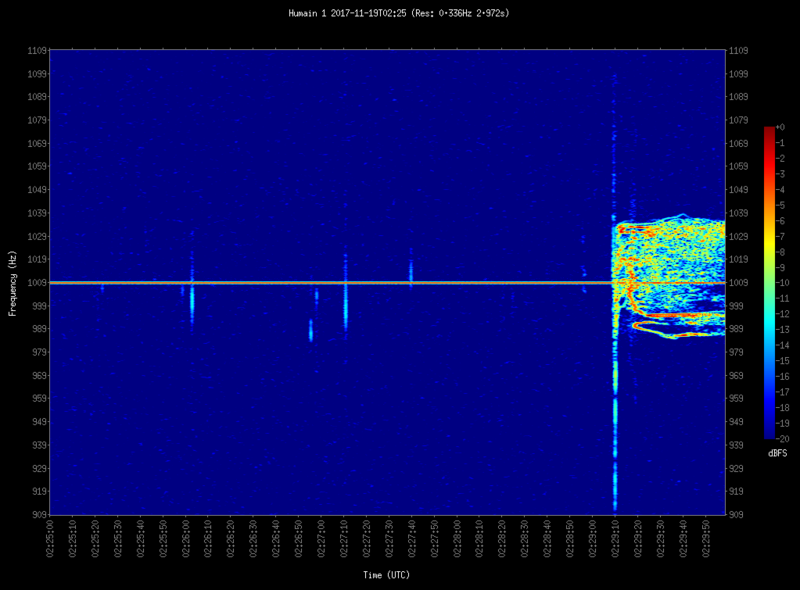 During the tests with the beacon on 12/05, several receiving stations were listening. You can see some examples below, respectively for Willy Camps (Tessenderlo) and Felix Verbelen (Kampenhout). They illustrate the nice improvements due to the add of the reflector. 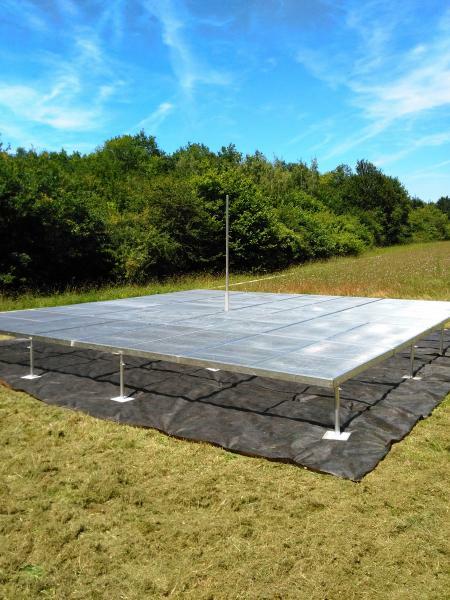 Last thursday (12/05), we made some tests with the beacon in Dourbes to simulate a metallic reflector of size 6m x 6m and 8m x 8m (using aluminium sheet of papers). 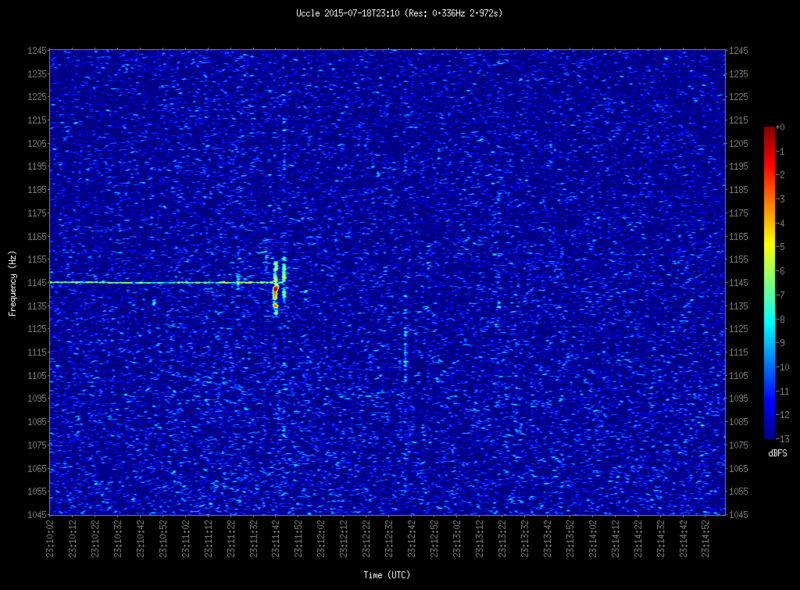 The beacon was shut down at 12h15 local time (10h15 UT). First image below shows data before the shutdown. 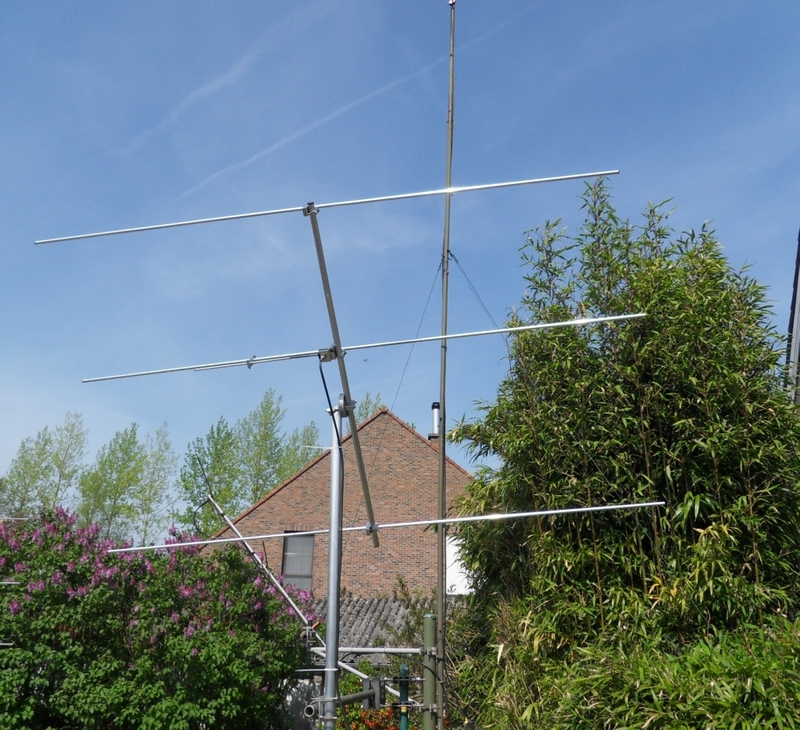 The test with the 8m x 8m "grid" was made from 15h15 (13h15 UT) to 15h45 (13h45UT). See second image below. 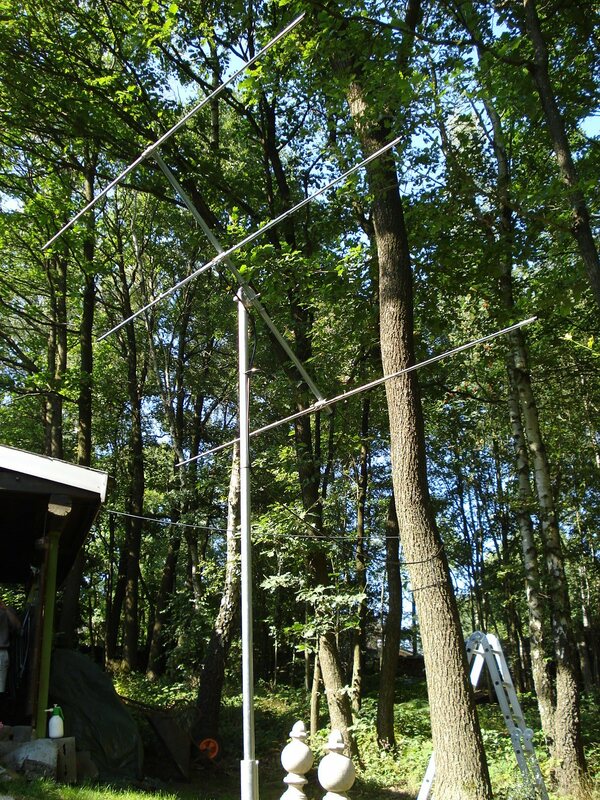 The test with the 6m x 6m "grid" was made from 15h52 (13h52 UT) to 16h00 (14h00UT). See third image below. 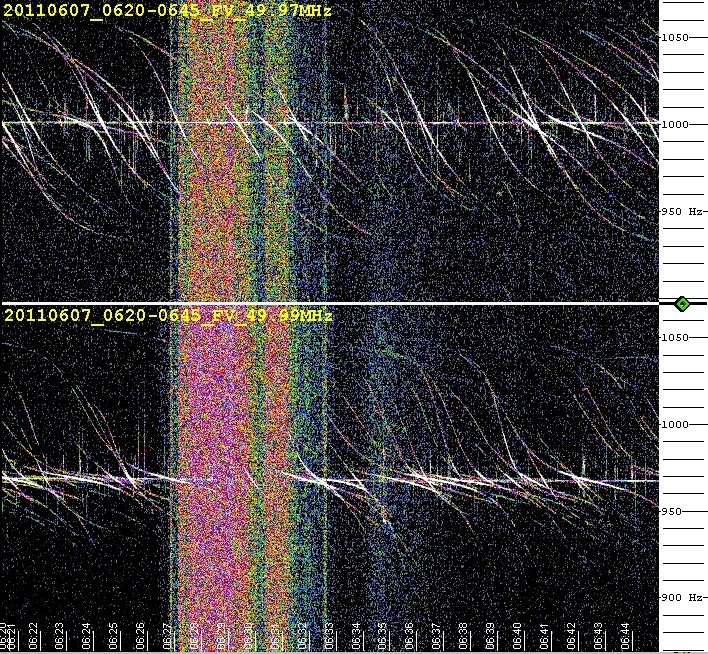 The spectrograms clearly show that the direct signal is strongly attenuated (although still visible) and the number of reflections on planes has also strongly decreased. 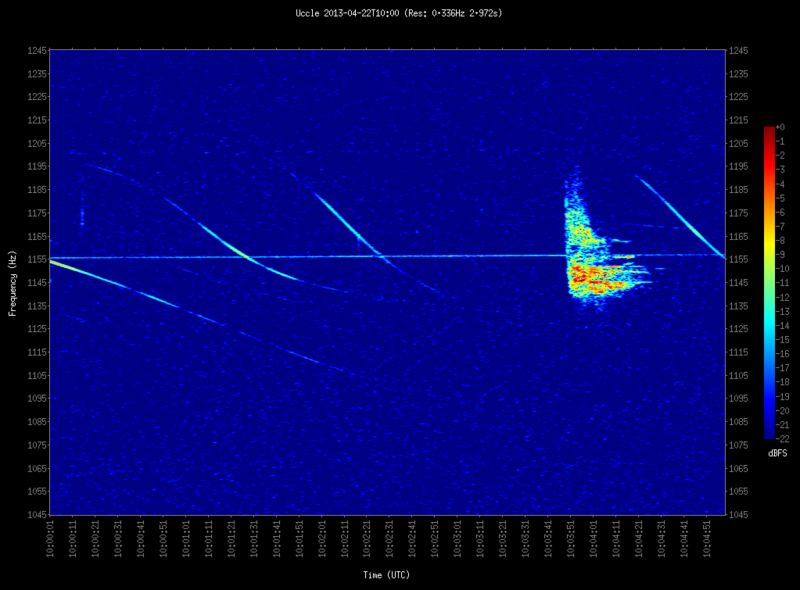 The intensity of the plane echoes is also strongly reduced. 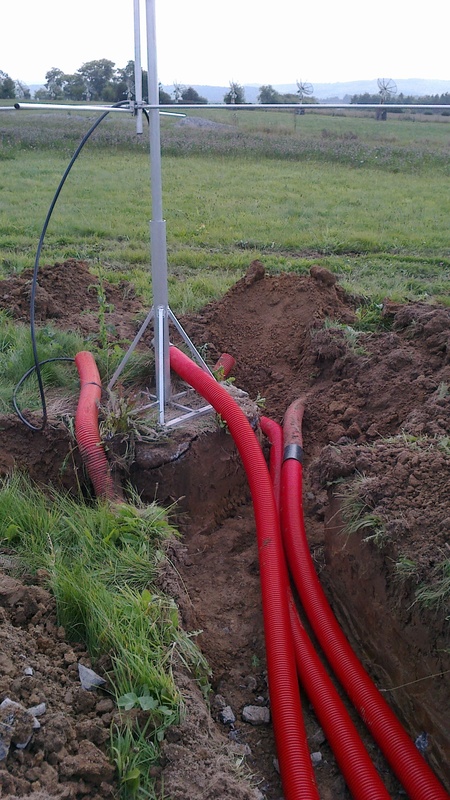 We started this week the installation of the first receiving stations of BRAMS. 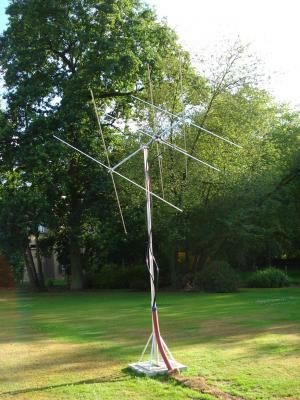 The first one was successfully installed on 11/04/11 in Kampenhout at Felix Verbelen's house. 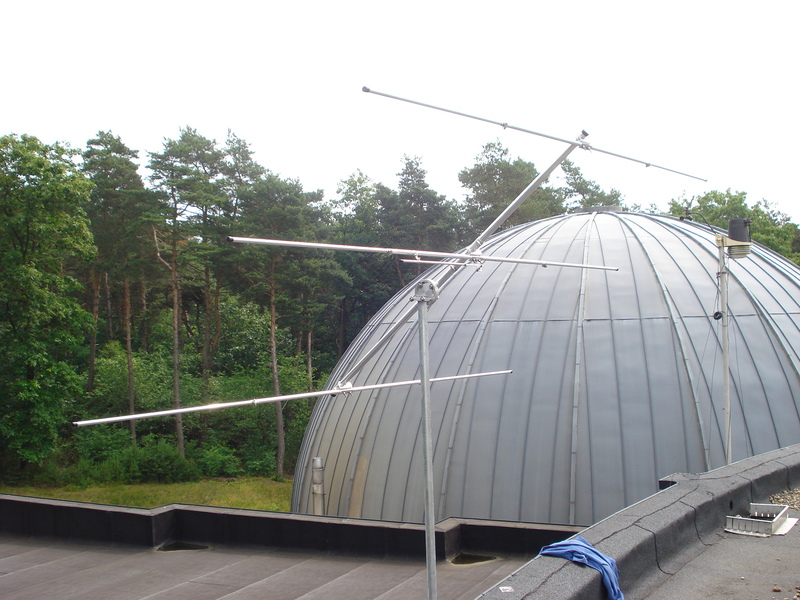 Then the second one was installed on 12/04/11 on the roof of MIRA's observatory in Grimbergen. 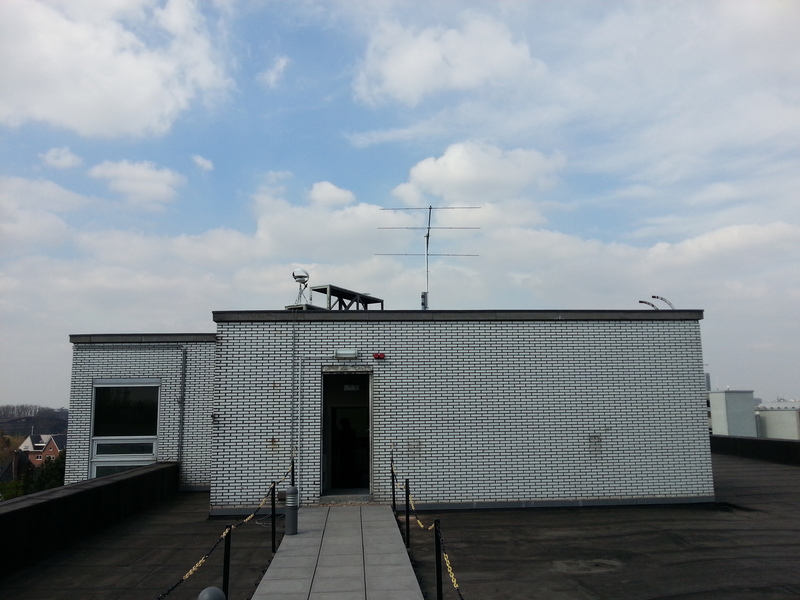 Below you can see 2 pictures from the antenna on the roof of MIRA and 1 picture of the station in Kampenhout. We will contact each of you individually when we are ready to install the material at your local place or when the material is ready to be picked up at BIRA. 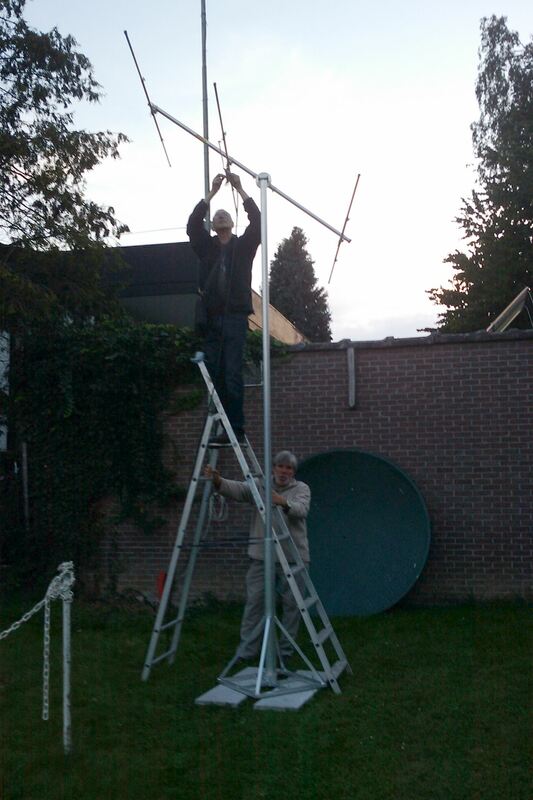 The VLF antenna has been installed in Humain. 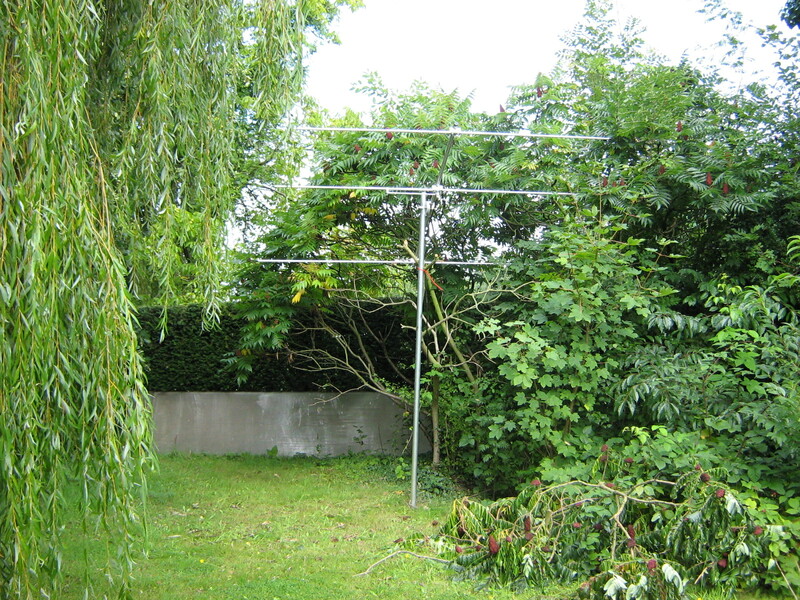 It is a magnetic field loop type of antenna with an area of about 50 square meters. The mast is 12 meters high. 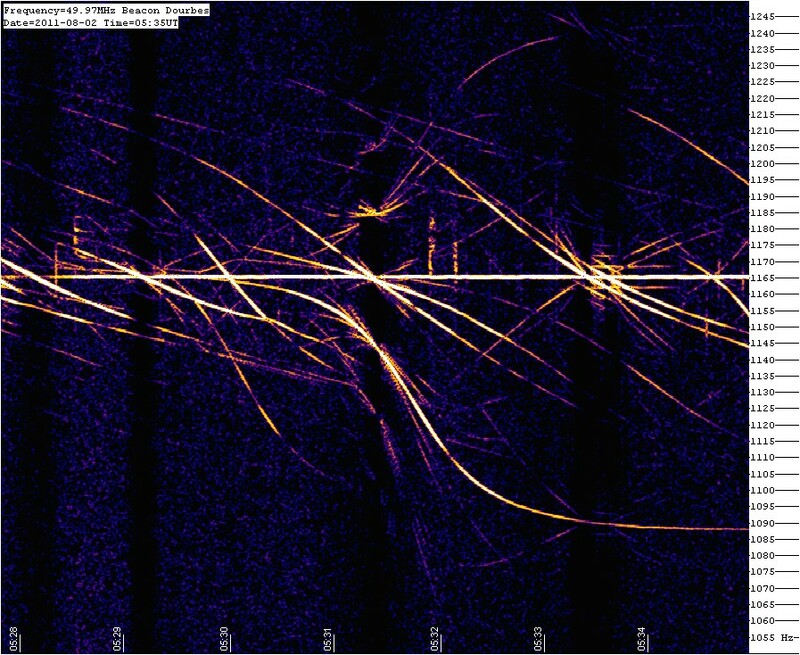 On the pictures below you can see two perpendicular loops oriented N-S and E-W which will allow us to measure both components of the magnetic field (or listen to the VLF emissions in stereo). 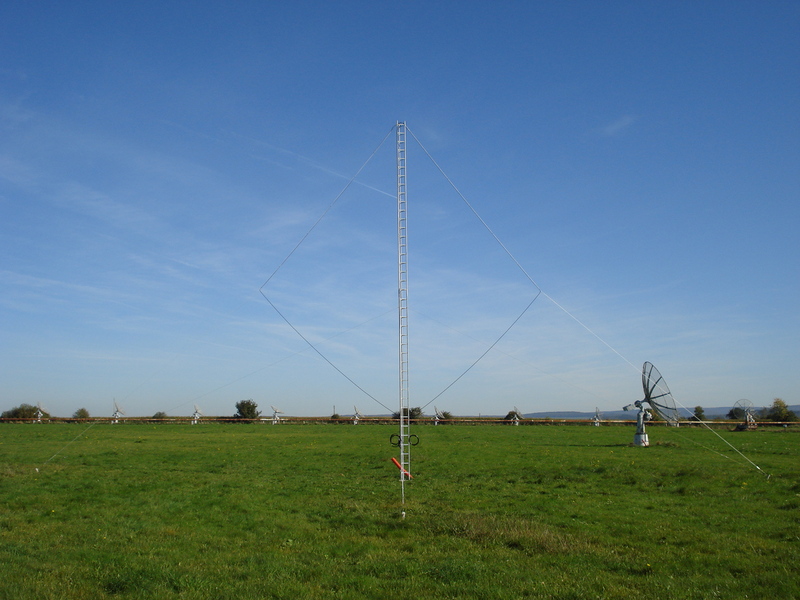 The primary goal of this antenna is to detect whistlers but since it will be located next to our future VHF interferometer, we will look for conjunctions of VLF emissions and VHF meteor echoes (as was done during dedicated campaigns by Jean-Louis Rault). The beacon in Dourbes is emitting since 21/09/10 around 14:00. 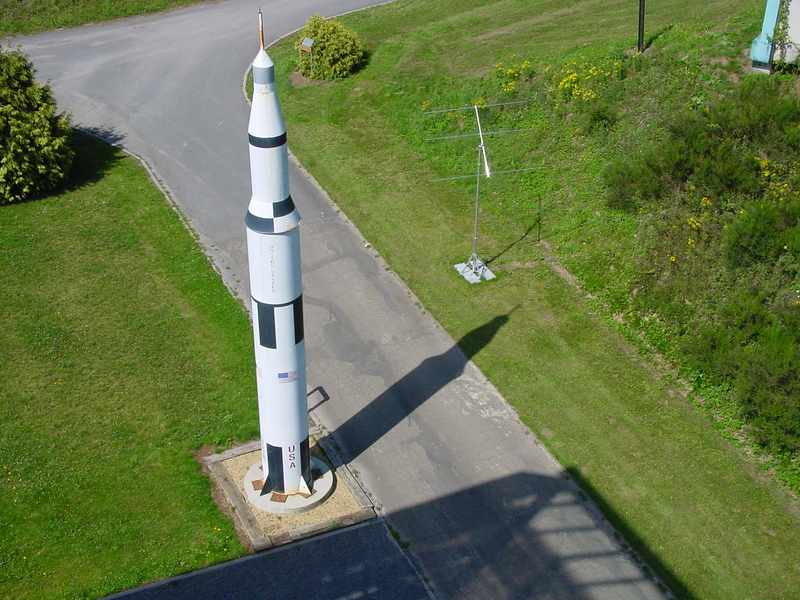 Pictures of the beacon are available in the related section. 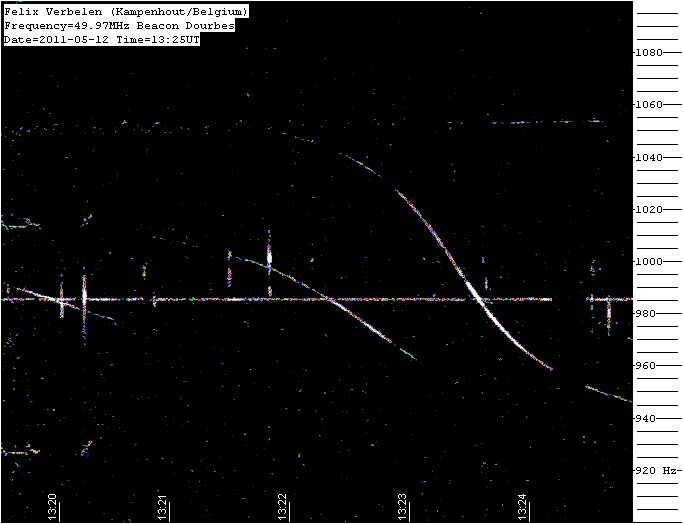 Nice spectrograms have already been posted by Jean-Louis Rault (South of Paris), Peter Knol (Appingedam, north of Netherlands), Karl-Heinz Gansel (Dingden, Germany), Jacques Gruson (Guéthary,south of France) and of course by several members of the VVS. 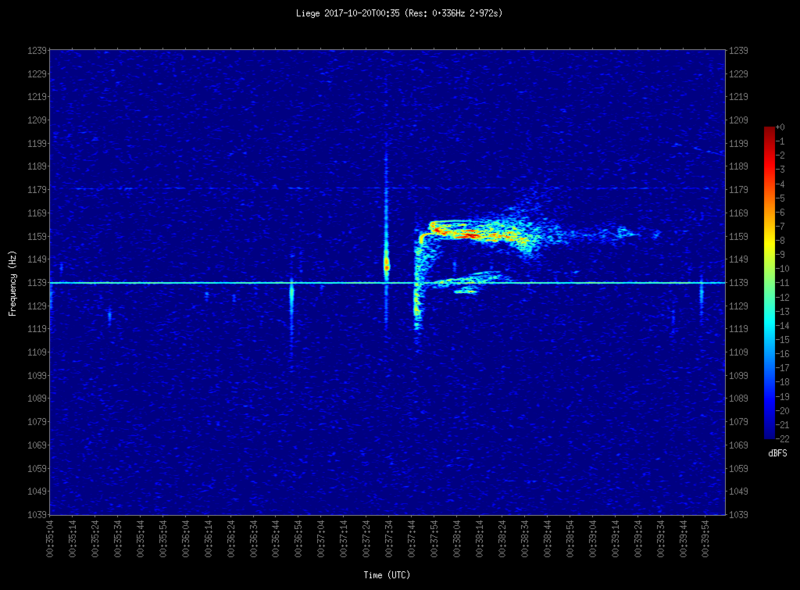 Unfortunately, the direct signal is quite strong for closer receiving stations and we will try to improve this in the coming weeks. 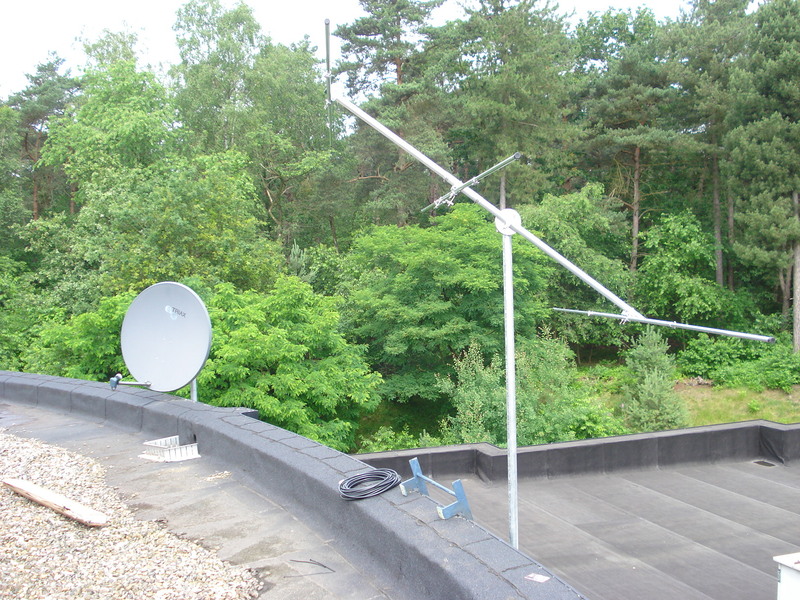 Also, the VLF antenna in Humain has been installed. Pictures and details available soon. Associated electronics and receivers should be installed before the end of the year. 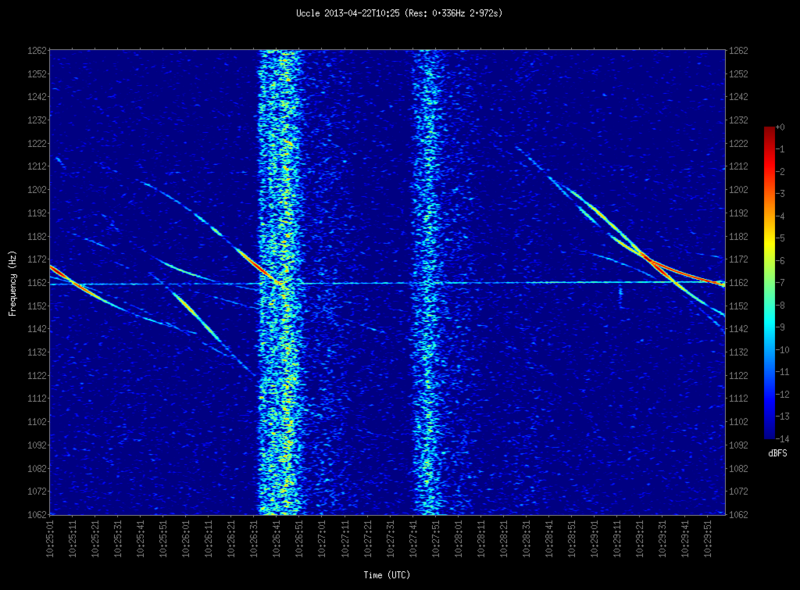 Three examples of the data recorded last night with the AR-5000 and the simple Yagi antenna. 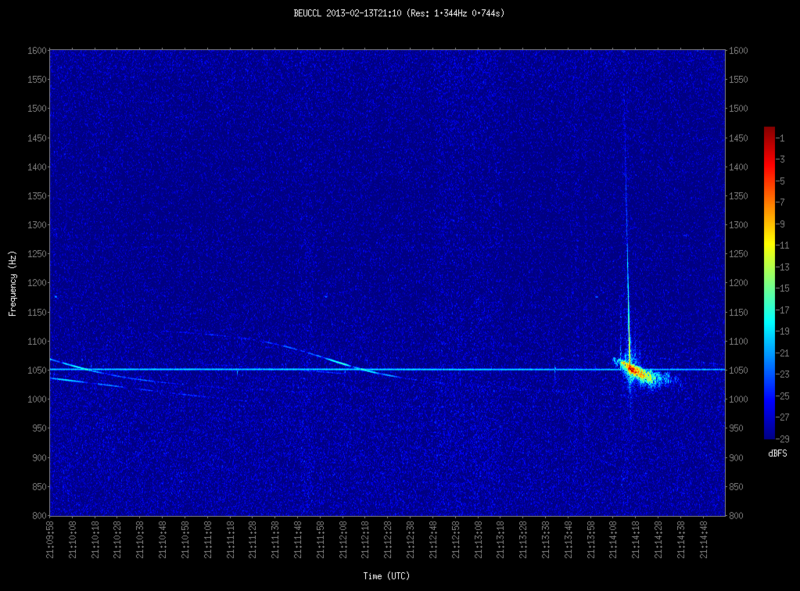 The tests with the new beacon in Dourbes will start within the next 2 weeks. We will let everyone know when the beacon is emitting. some 50 Ohms coaxial cables with the adequate length. For those interested to host such a station, we kindly ask you to provide us an estimate of the length of the coaxial cables you would need. Nearly all the material has arrived : signal generator, power amplifier, antenna (built in the workshop). Only coaxial cables are missing. 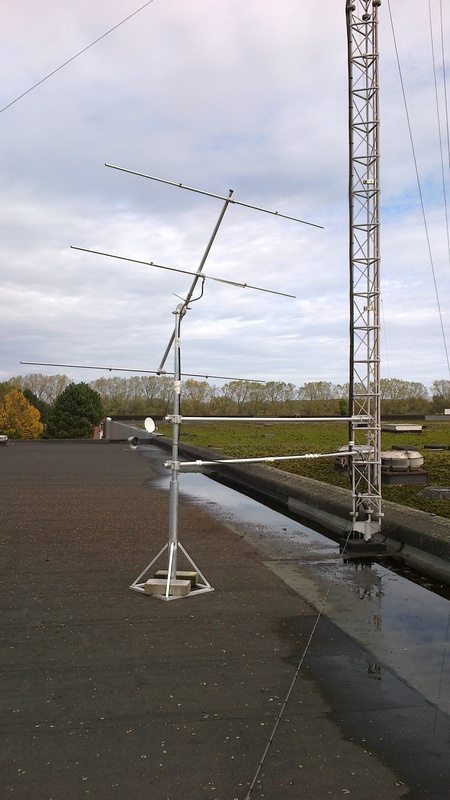 For the initial tests in Dourbes, we will use a two-element Yagi antenna like the one in Ieper. 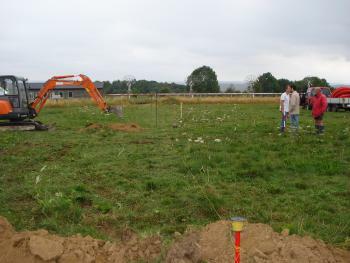 These tests will also allow us to check we do not perturb the other instruments located on the Dourbes site. 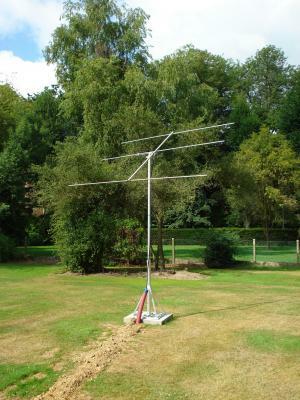 Later on, We will use a metallic grid of 8 m x 8 m as the reflecting part instead of the simple reflecting tube of the Yagi antenna. With this configuration, the gain will be significantly larger. We will work on this grid during the summer. We will ask everyone if they agree to host a station and who has enough space for it. We will organize a meeting in September/October in order to discuss this topic and maybe to start distributing the material. 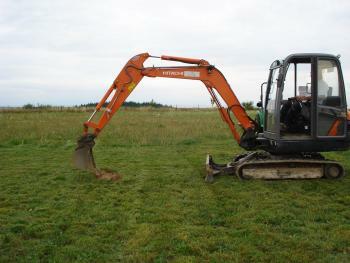 Works have started on August 4. Tranches have been digged and concrete blocks have been made. 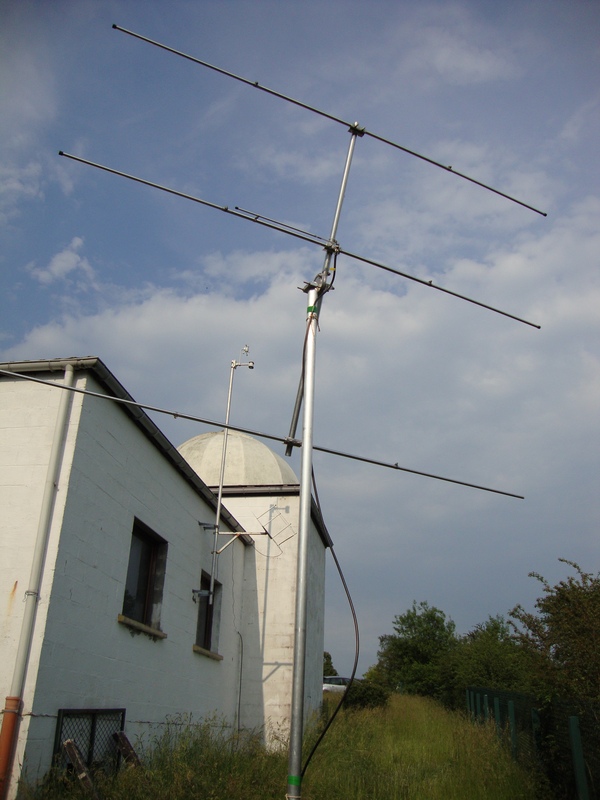 We will also install a mast of 12 meters high supported by guy-wires which will act as a VLF antenna. 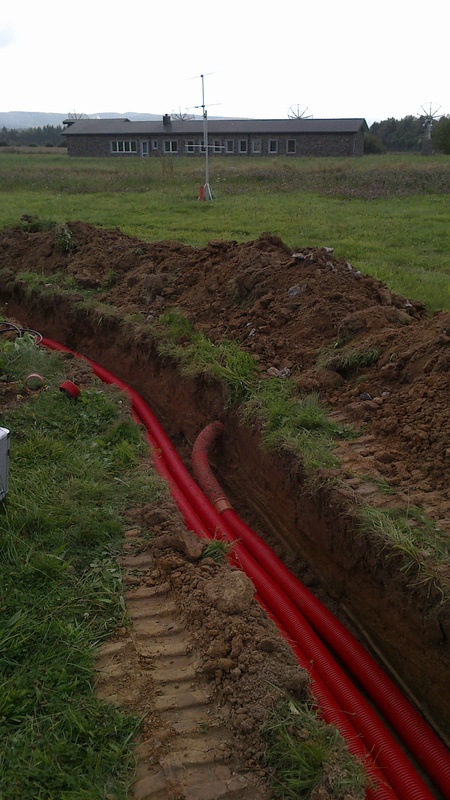 Cables will be installed in a way to make a rhomb with a surface of approximately 50 square meters. 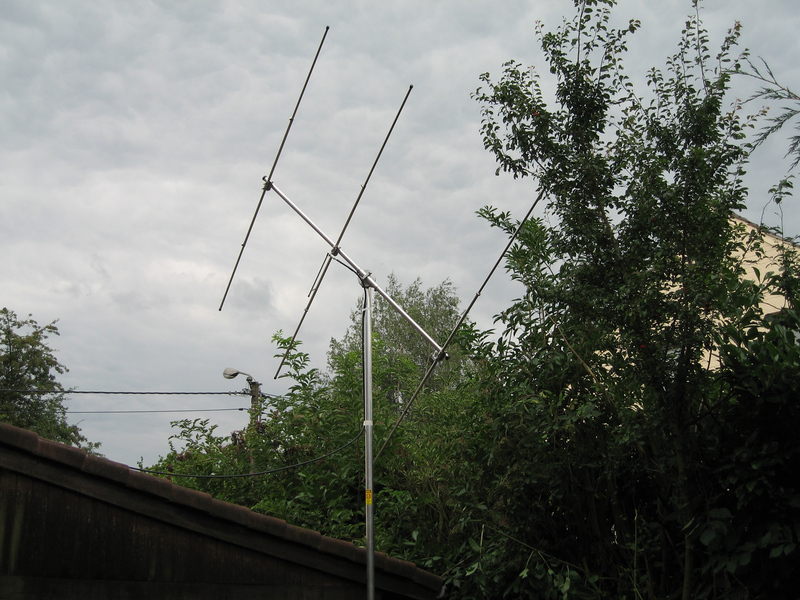 This will act as a magnetic antenna. 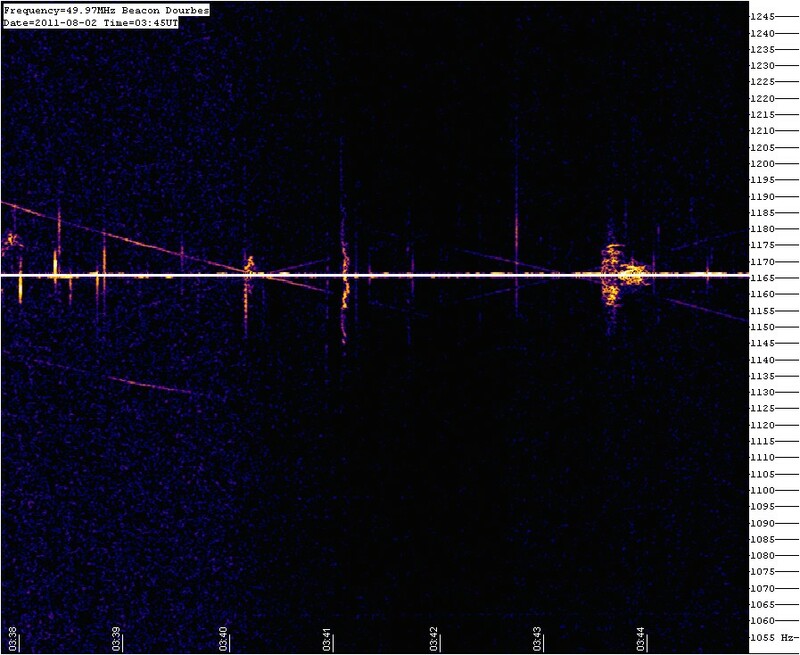 Although it will mainly be used to detect whistlers, we also plan to look for coincident VHF meteor echoes and VLF emissions. 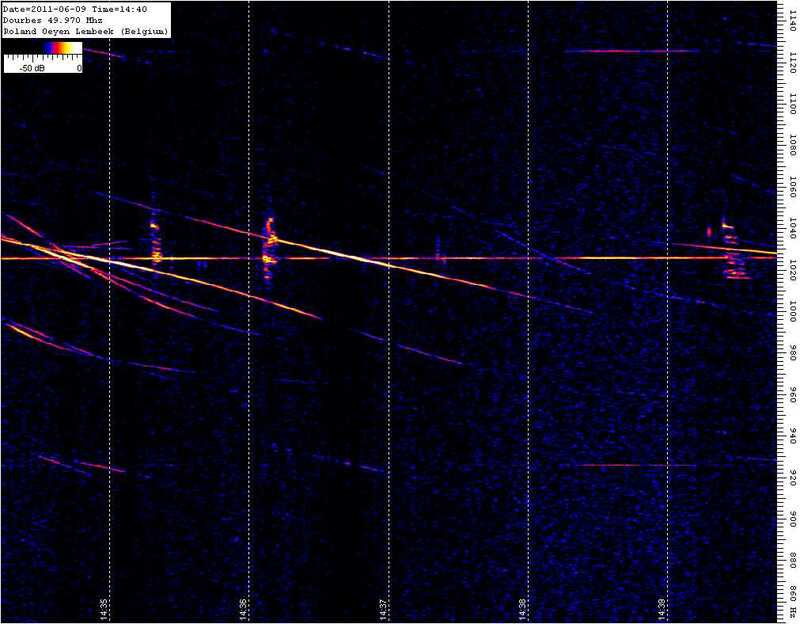 Two students from Pierre Ernotte at EPHEC have worked on an automatic detection method of meteors in spectrograms in the framework of their master degree. They presented their results at BISA in June. We intend to continue the collaboration with these students during the summer (as summer jobs) and with other students from EPHEC next year. An Action 1 proposal has been sent to Belspo (Belgian scientific policy) to get fundings for one scientist for a period of 4 years to work on and analyse the future BRAMS data. Today we give a presentation about the BRAMS project at the Meteorendag in public observatory Halley in The Netherlands. During the presentation we will give a general overview of the project. Today we have set-up a FTP server for people that have joined our project. Initially, you can use this server to upload your WAV files when there is an interesting event (such as a nice head echo). It will then be easy for anyone who wants to do some analysis with these data to download them. Later we'll find some other applications for this FTP server. We have ordered an OX32 crystal at HM International according to suggestions from Gaspard Dewilde and Michel Anciaux (one of our new collaborator at BISA). We will very soon order a power amplifier and additional components needed to have a beacon emitting a power of 150W at a frequency of 49.970 MHz. Once we have all the details concerning the commercial instruments we will use, we will send them to the IBPT and we will offically buy the frequency slots. We still have to carefully think where to locate this beacon. 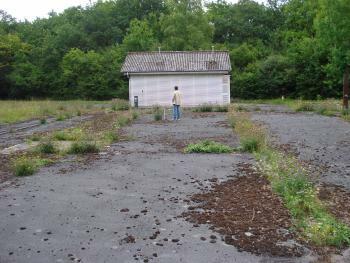 Discussions will be started soon with René Warnant who is responsible of the Dourbes site. 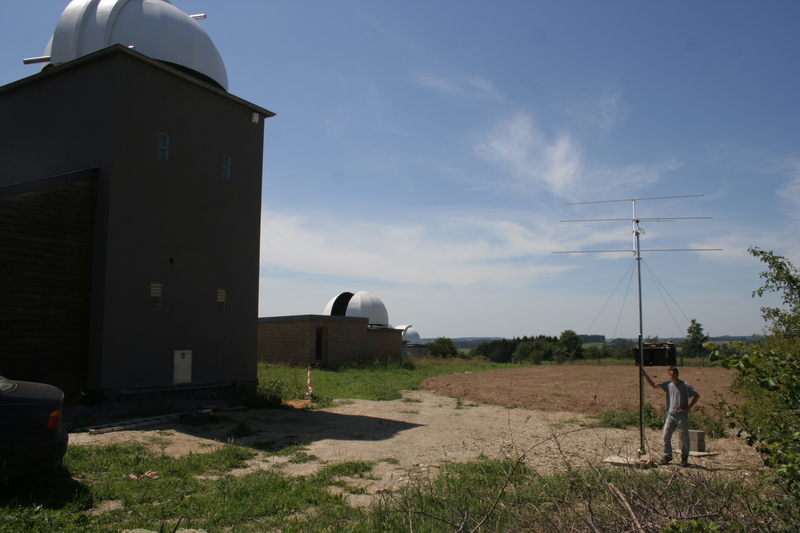 During this week-end (October 3 and 4), the Open Doors of the Institute are organized (together also with the Royal Observatory and the Institute of Meteorology). As an activity, we will show our new receiving station. 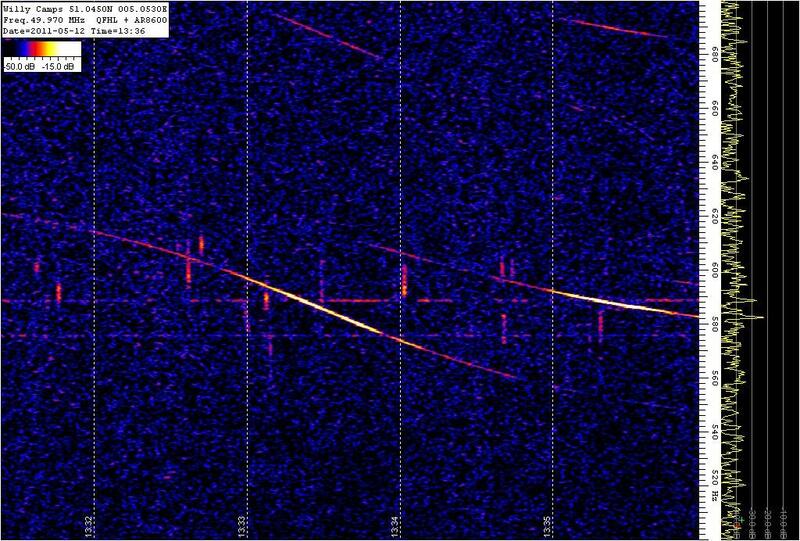 Since we have some problems to listen to the frequency of the Yper beacon, we will listen to some Eastern European TV emitters at 49.7385 MHz where we see a lot of meteors. We will also make some advertisement of our common project. The first tests to listen to the beacon frequency in Yper haven't been successful because of the presence of a local annoying repetitive and strong signal that prevented us to see any meteor reflexion. We will first check if this signal is very local or not. 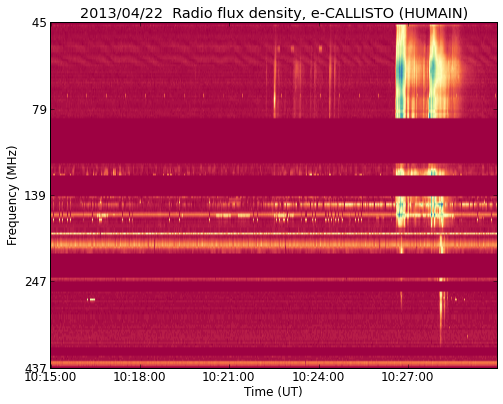 If it is not coming from the Uccle Plateau, then we will ask the IBPT to find out who is emitting at this frequency. 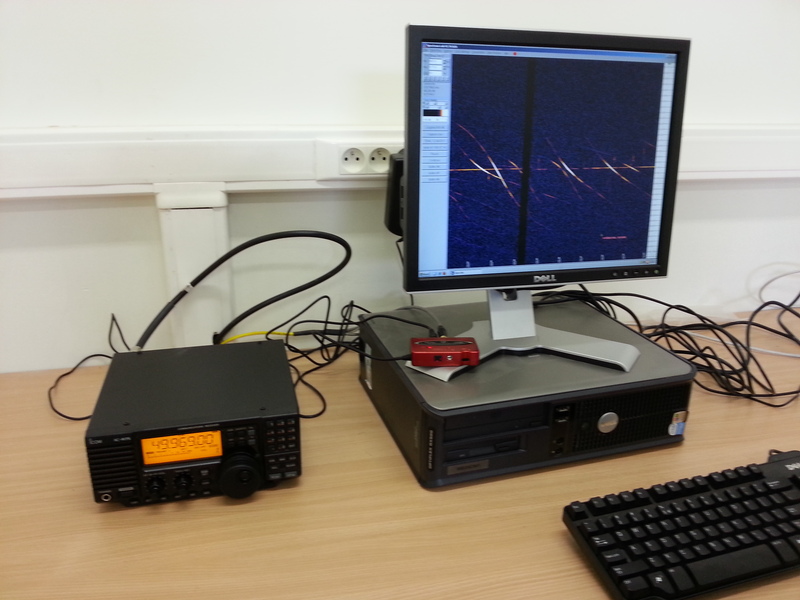 This morning, we have received two boxes with our radio receiver and antenna. 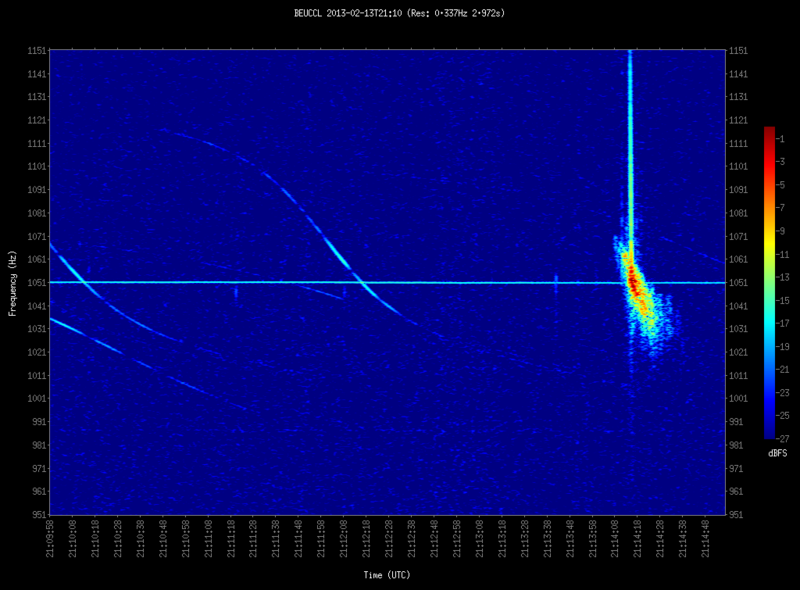 This very special moment marks the beginning of our radio meteor observation network. 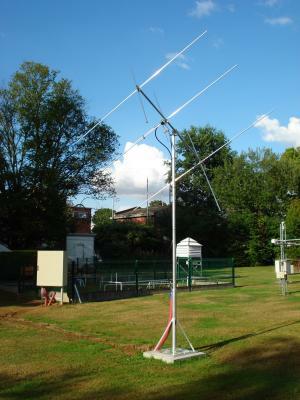 The receiving station is composed by a 3-element Yagi antenna connected to an AR5000 commercial receiver.